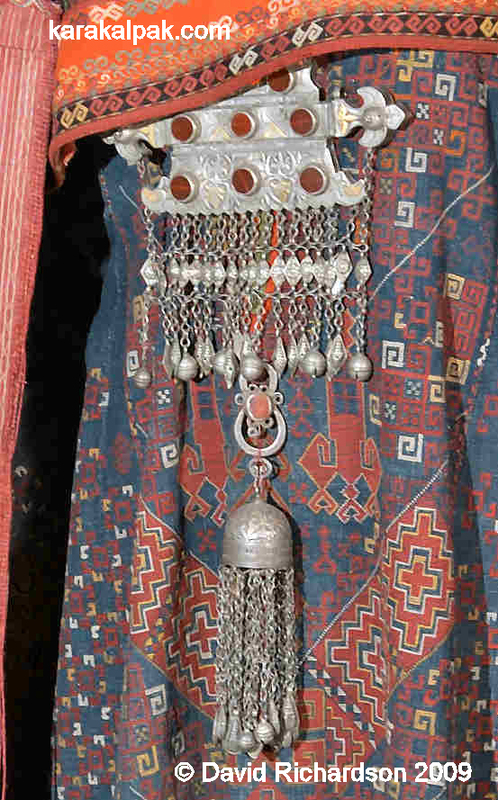 Jewellery, especially silver jewellery, formed an essential part of a Karakalpak woman's costume. It was worn by all levels of society. Rich people were able to commission a full set from a jeweller or zerger. Less wealthy people could only afford to have a limited amount and it would be of poorer quality material and roughly made. Jewellers were able to produce and sell such poorly made items because of their perceived protective properties. 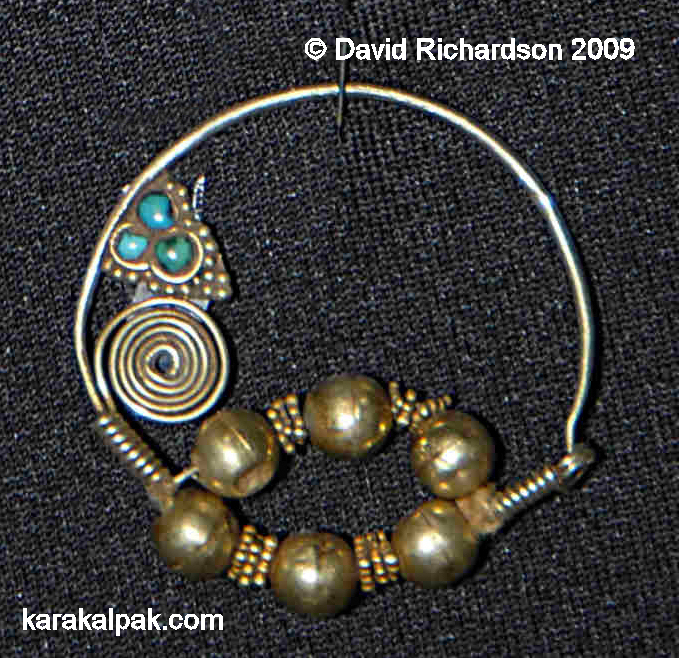 Some jewellery items, such as the tumar, were believed to be able to drive away the evil eye. hay'kel breast decoration. From a painting by Berdimuratov in the Regional Studies Museum, No'kis. During the 1920s Anna Morozova observed that Karakalpak women still wore lots of heavy jewellery for special occasions. However by the end of the 1930s they had stopped wearing many of these items such as amulets, pendant earrings and o'n'irmonshaq. Traditional jewellery making was greatly affected by the import of factory made goods from Russia at the beginning of the 20th century. At the same time local jewellers began using moulded stamps in place of traditional techniques such as chasing. It led to far greater uniformity and lack of individuality in jewellery pieces. 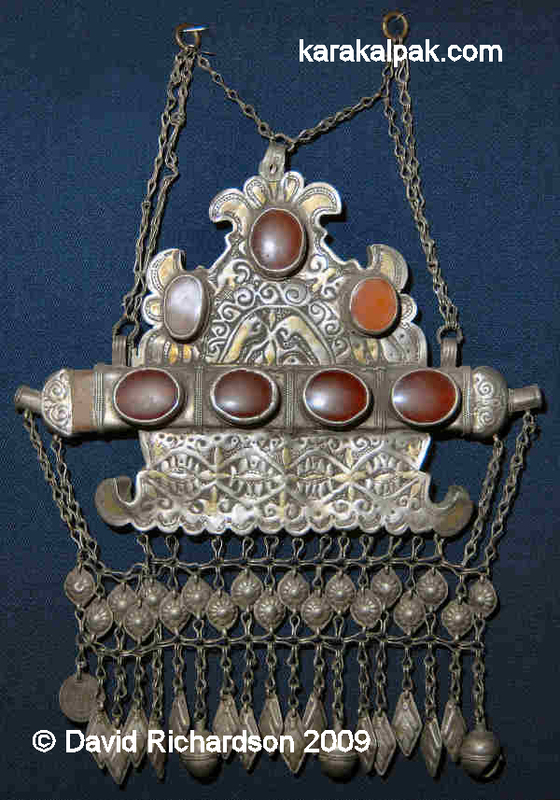 The quantity of jewellery worn by women decreased and fashions became increasingly influenced by the lighter Uzbek pieces. Shalekenov, writing in 1958, says that women and girls wore bracelets, earrings, beads, and rings which were mainly manufactured by the local (Shımbay) urban combine. One mystery concerns young girl's headwear. In her 1954 thesis Morozova recorded that in the past young Karakalpak girl's wore skullcaps known as taqıya-tozıy that were decorated with jewellery. These had a silk pompom on the top and were completely covered with pieces of jewellery. However Morozova never encountered one of these caps and there are none held in the No'kis museums. Interestingly Muravin, who made the first brief record of Karakalpak and Qazaq costume in 1740, noted that Karakalpak and Qazaq female costume was very similar. Young girls had the same hair style and Qazaq girls wore tafeyka on their heads, which were decorated with mar'yan (coral), halved seeds and sometimes money. Tafeykas were also worn by the Aral Uzbeks. 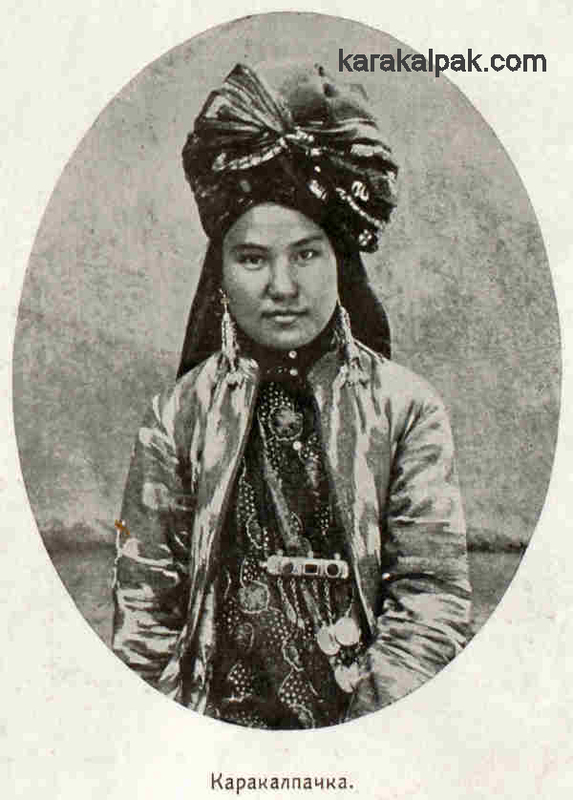 We can only assume that the taqiya-tozıy may have had some similarities with the skullcaps worn by Turkmen girls. As well as being an indication of her social standing, a Karakalpak woman's jewellery also reflected her age and marital status. At present it is very difficult to be clear which jewellery belonged to which age/marital division. In the past this was obviously more clear-cut but the rules have gradually become blurred. Ethnographers who questioned elderly women in the 1970s received contradictory information on this subject. For example some said that bracelets, rings and nose-rings were worn by girls before marriage and others that no ring-shaped items were worn until after marriage. Traditional Karakalpak jewellery has some similarities to the jewellery of the neighbouring nomadic and semi-nomadic Turkic tribes such as the Qazaqs and the Turkmen. However it has much less in common with that of the settled Khorezmian Uzbeks. During the 17th and early 18th centuries the Karakalpaks living along the Syr Darya lived close to, and were frequently governed by, the Qazaqs of the Lesser Horde. As they migrated into the Aral delta they settled near to, and formed an alliance with, the Aral Uzbeks. Over time they were both forced to acknowledge the authority of the Khivan Uzbeks. The Karakalpaks who settled in the western and southern parts of the delta came into contact with Yomut, Chodor and Arabachi Turkmen, many of whom were far from friendly. 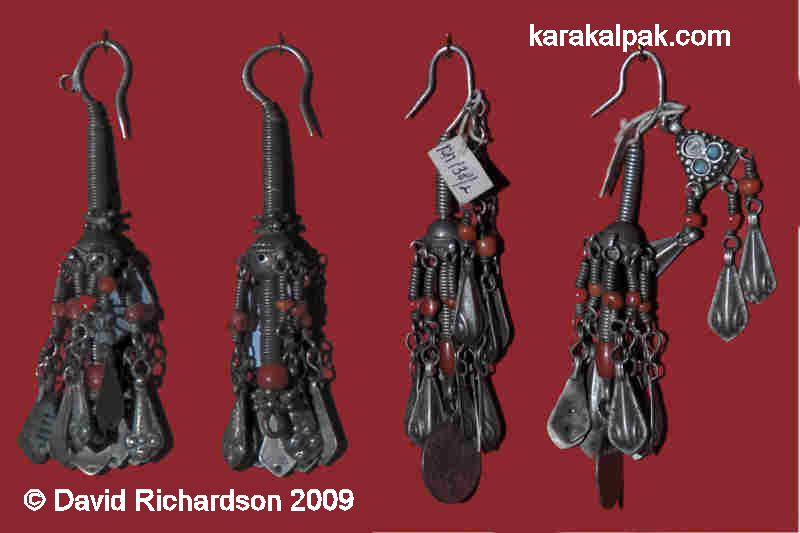 Traditional Karakalpak jewellery is a difficult subject to study. 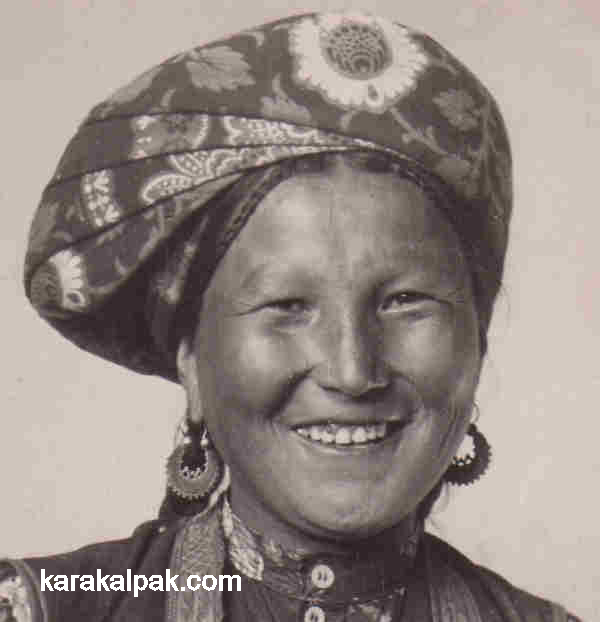 There are few enough historical descriptions of the Karakalpaks as it is and only a minority of these make any mention of female jewellery. It was not until the mid-19th century that ambassadors, military observers, and surveyors began to enter the Aral delta, by which time many Karakalpaks had been reduced to abject poverty. There is no description of a wealthy Karakalpak family or any recorded observation of a Karakalpak wedding or other formal ceremonial occasion. 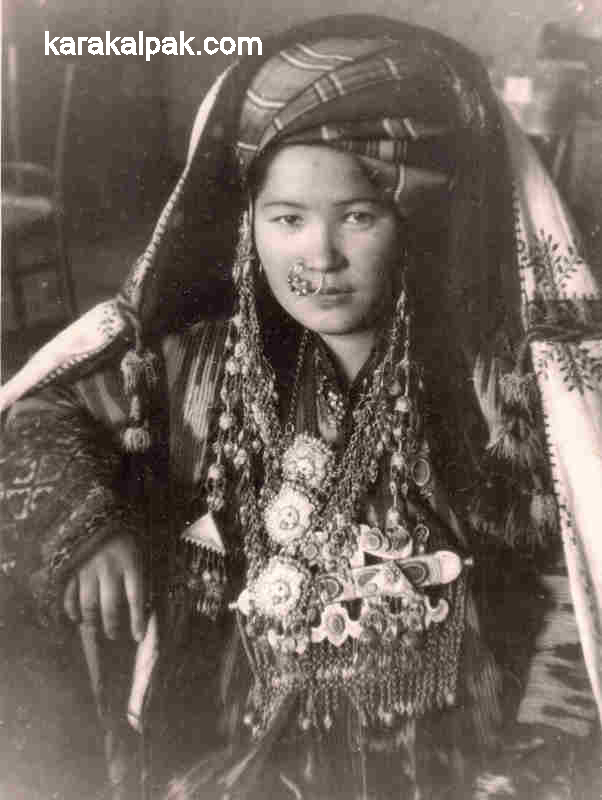 A young Karakalpak woman wearing a mixture of Karakalpak, Uzbek, and Tajik jewellery, probably 1930s. The photograph looks staged. Reserve of the Karakalpak State Museum of Art named after Savitsky, No'kis. Photographic evidence is also limited. The Turkestanskiy Albom, a fantastic collection of ethnographic photographs compiled on the orders of General Kauffman, was completed just before the fall of Khiva and the annexation of the Amu Darya Otdel. Consequently it excluded all of the people living in the lower Amu Darya. The photographs taken by Melkov in the late 1920s tend to show women at work and therefore not dressed in their finery or wearing full jewellery. Some of the photographs held in the archive of the Savitsky Museum probably date back to the 1930s and look very staged. During the Soviet era women were mainly photographed for political purposes, working for the collective farm in the cotton fields. One final problem concerns attribution. 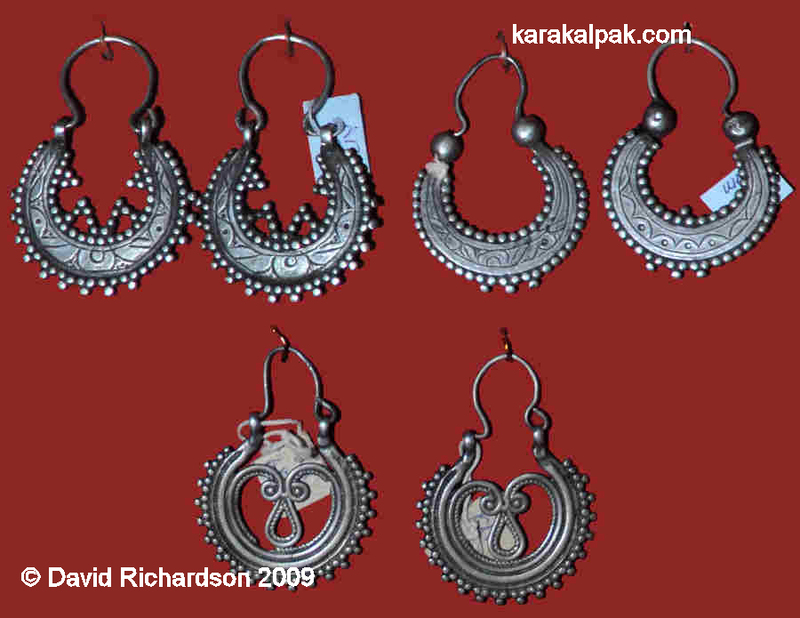 Unlike costume or yurt decorations, some items of Karakalpak jewellery are similar to Qazaq, Turkmen, or Uzbek items. It is often difficult to assign such items to their ethnic category once they have been removed from their context and have lost their provenance. They tend to be labelled with the catch-all "Central Asian" or, more disturbingly, attributed to whichever group the seller feels the buyer is most interested in! Place of purchase is no guarantee of origin as we have seen Karakalpak jewellery for sale in locations ranging from Bukhara to Ashgabat and from Istanbul to Kuala Lumpur. During the 19th century the sa'wkele was the pinnacle of the Karakalpak jeweller's craft - the most exclusive and expensive creation imaginable. However the sa'wkele is such a rare and important item of Karakalpak material culture that we have devoted three separate web pages to its description and history. Please click here for more details. and afterwards wind it together with the white coarse calico, made for the purpose, to the ground". Unmarried girls generally plaited their hair into four small braids. Their hairstyle differed from that of the Khorezm Uzbeks and Qazaqs in that they had two small plaits at the front of their temples in addition to the main plaits descending down their back. These temple plaits were in turn made of two smaller plaits wound together. They were known as tulımshaq and were worn from the age of about 11 to 12 years old. Plait decorations, which were known as shashbaw (shash � hair, baw � tape), always came in pairs. Unmarried women wore separate shashbaw in each plait. They were 2 to 2½ centimetres in width and were woven on an o'rmek loom. Beads and coins were sewn onto them and tassels adorned the ends. The change from the unmarried state to that of a wife was marked by a change in the hairstyle and plait decorations. According to Morozova a woman stopped wearing the tulımshaq hairstyle after the first washing of her hair at her husband's house. Unfortunately, we do not know exactly when this took place. Aygu'l Pirnazarova believes that while dressing the bride for her wedding her sister-in-law took these small plaits and arranged them at the back of her head. She then covered the bride's head with a bas oramal (large shawl wound around the head to form a kind of turban). On the fourth day of the wedding the hair from these temple plaits was gathered into the main plaits. We do not know whether or not this coincided with the first washing of the hair. The other change that occurred at the time of marriage was that the shashbaw decorating the two main plaits were now connected at the base by a piece of narrow black textile called a jemelik, which was sometimes embroidered. Sometimes keys were attached to the ends of a woman's plaits. Esbergenov mentions that women also wore white cowry shells at the ends of the plaits as amulets to prevent miscarriage. Another kind of plait decoration was known as a sholpı. These were made from local ten'gi coins. There is no information recorded about these decorations or whether they were worn by girls or women or both. Karakalpak and Qazaq sholpı plait decorations. On the left is a sholpı from the Regional Studies Museum in No'kis utilizing coins including an 1895 rouble. On the right is a 19th century sholpı from North Kazakhstan. This is in the collection of the Abylkhan Kasteev State Museum of Arts of the Republic of Kazakhstan. "The coastal inhabitants are Karakalpaks. Their facial features are more regular, and more beautiful than the Kirghiz [Qazaqs]. 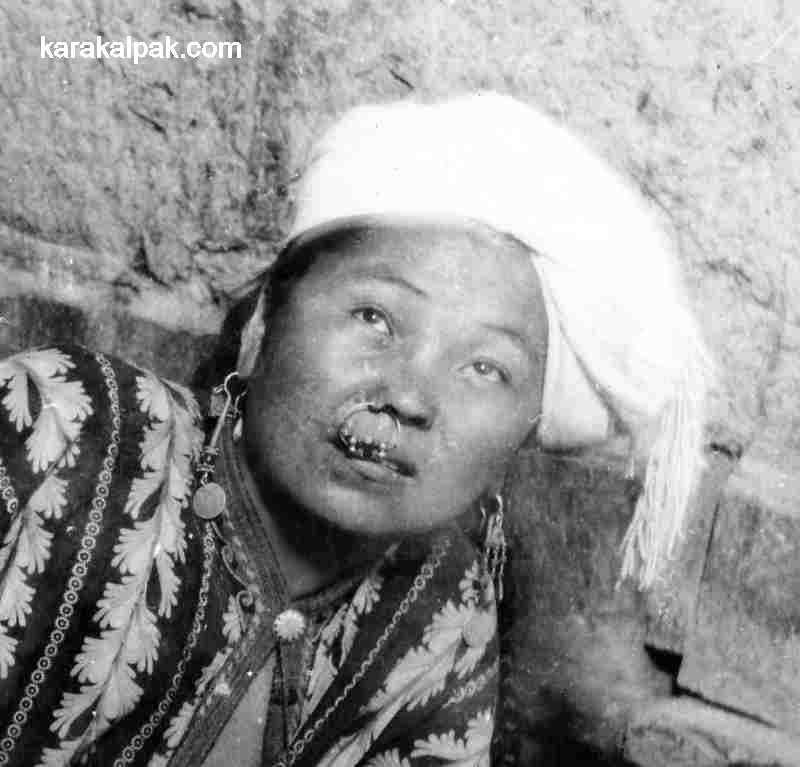 Some Karakalpak women wear a ring in the nostrils." "Sometimes they wear the ring, passed through one of the nostrils, which disfigures the face terribly." A'rebek were very common in the northern regions of Karakalpakstan at the end of the 19th century. However by the end of the 1930s women had stopped wearing them even in the rural areas. Morozova writes that in 1948 women had started to wear their a'rebek as earrings � they simply ordered another one to make a pair. Conducting research in the 1970s O'temisov found that they were still kept in many homes but were no longer worn. They were often decorated with a spiral shaped curl of gold wire and sometimes incorporated stones such as coral or turquoise. They were worn in the right nostril and were described by the type of stone they contained � thus a piruza qaslı a'rebek was a turquoise stone nose-ring while a marjanlı qaslı a'rebek was a coral stone nose-ring. A piruza qaslı a'rebek from the Savitsky Museum, No'kis. Young woman wearing an a'rebek photographed by Aleksandr Melkov in 1928. 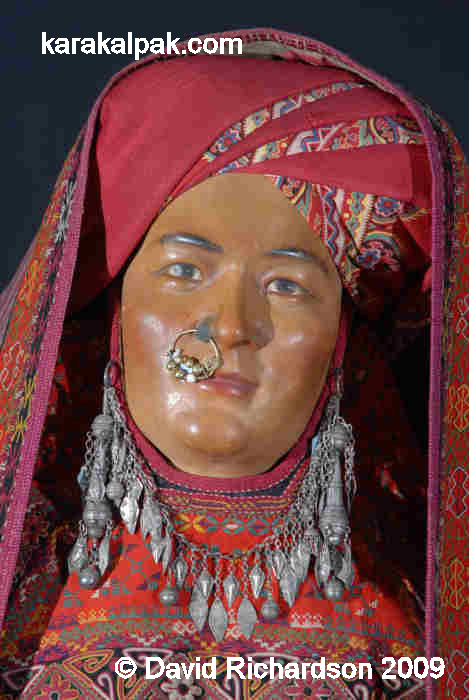 "Besides rings and earrings, some of the Nogay women wear a golden ring in the cartilage of the nose so large that it reaches to the lips; and even some of the Tatar women in the city of Astrakhan follow this custom. The women of Kundorov wear this ring in one of their nostrils." "... wear silver earrings in their ears, very large but, like the bracelets, of very rough work and Russian silver coins frequently serve as pendants to them. Sometimes the earrings are so heavy that, besides the opening in the ear, they are supported by a thread which circles around the entire ear." At the turn of the 19th century there were many different types of sırg'a, the most impressive and ancient of which was probably the halqaplı sırg'a. This decoration consisted of a pair of earrings connected to each other by a chain or necklace from which were suspended numerous pendants. The description halqaplı seems to mean circular and refers to the necklace component. There are various spellings of this including halqalı, qalqalı, and halqanlı. We have chosen to use that given in the Karakalpak Glossary of Artistic Crafts. Example of a simple halqaplı sırg'a from the Savitsky Museum, No'kis. 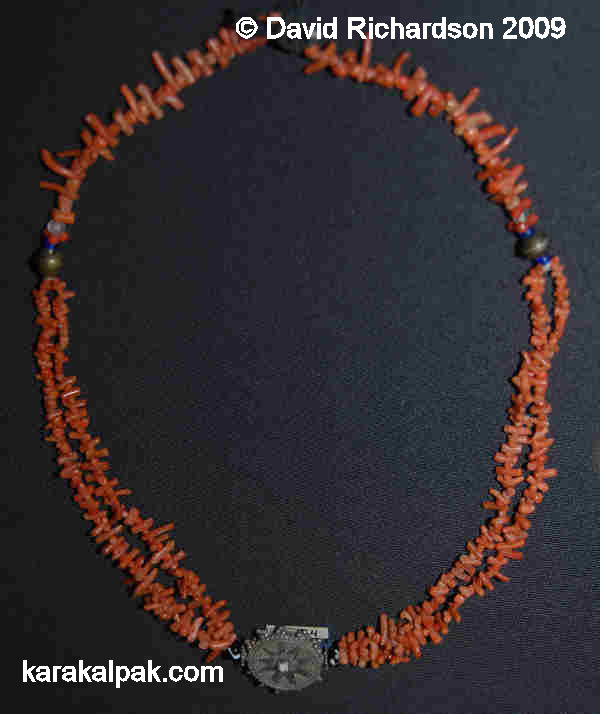 Other examples incorporate coral beads on the pendants. 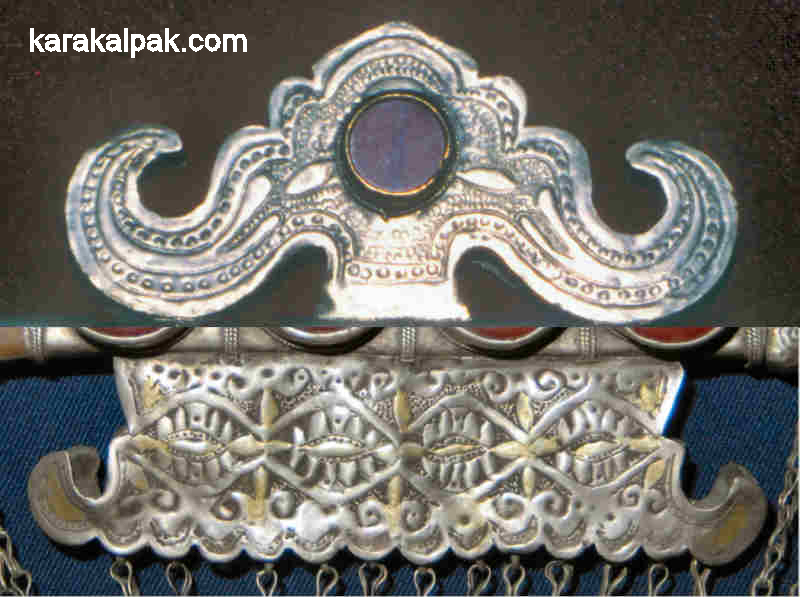 The Karakalpak halqaplı sırg'a is remarkably similar to an item of Khorezmian Uzbek jewellery known as a shokila. The main difference seems to be that the necklace of the shokila is connected to two temple pendants, rather than two earrings. 19th century silver, coral, and glass shokila from Khorezm. From the Jewellery Art of Uzbekistan, Fakhretdinova, 1988. The halqaplı sırg'a was worn by a girl from the age of 12 until her wedding, and then for the following three days afterwards. Mannequin of a Karakalpak bride wearing a halqaplı sırg'a. On the fourth day of marriage it was removed. After the halqa or chain part had been removed the newly-wed bride continued to wear the earrings which then became known as either soyaw sırg'a or baldaqlı sırg'a. Woman wearing soyaw sırg'a and an a'rebek. Image courtesy of the Regional Studies Museum, No'kis. Date unknown. A pair of soyaw sırg'a. Sobıqlı sırg'a were a simpler version of the soyaw sırg'a with the same basic shape of a small cone or droplet but without any pendants. The word sobıq means bean. Marjanlı sırg'a are also somewhat similar but have the addition of small coral or marjan beads. Two pairs of marjanlı sırg'a from the Regional Studies Museum, No'kis. 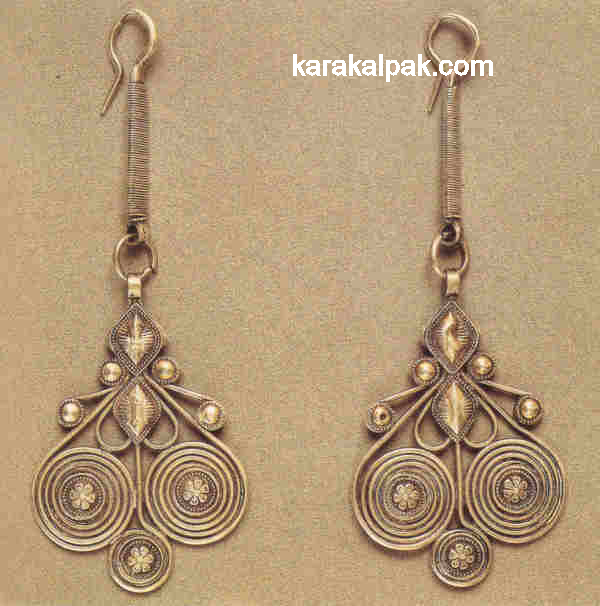 Bu'rshikli sırg'a were small earrings, generally of silver, in the shape of a half-moon. The pattern was achieved by means of granulation. Esbergenov suggests that women began to wear these at the age when they were capable of bearing a child as the moon shape is linked to fertility. 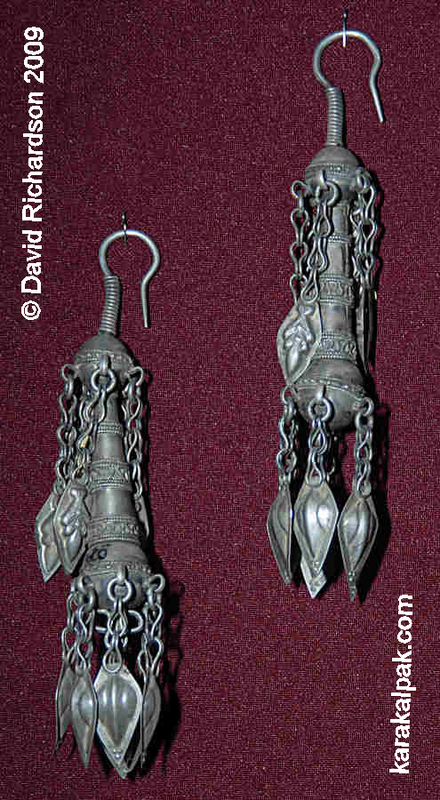 He argues that the figures incorporated on the inner curved edge of some of these earrings may be anthropomorphic. Three examples of bu'rshikli sırg'a from the Regional Studies Museum, No'kis. 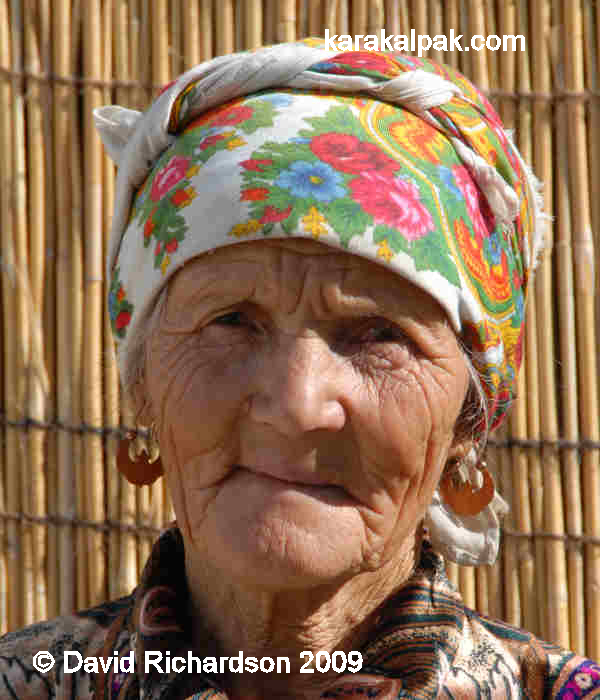 Arzıxan Umarbaeva from Kirov kolxoz Shımbay region wearing bu'rshikli sırg'a. She was a Stakhanovite who exceeded her production targets - in 1937 she picked 130kg of cotton in just one day. Jalpaq sırg'a (flat earrings) came in various sizes. They were often made of tilla' - an alloy of gold and silver. A Karakalpak woman wearing jalpaq sırg'a photographed in Sarı Altın in 2007. The final type of earrings are the shıyırtpaq sırg'a. These are long and flat and generally have three concentric circles. They were worn by elderly women. Left - a pair of shıyırtpaq sırg'a from the Regional Studies Museum, No'kis. Right - pair of shekelik from Western Kazakhstan from the Kasteev State Museum of Arts, Kazakhstan. Although the two sets of jewellery shown above look very similar they are used for different purposes. 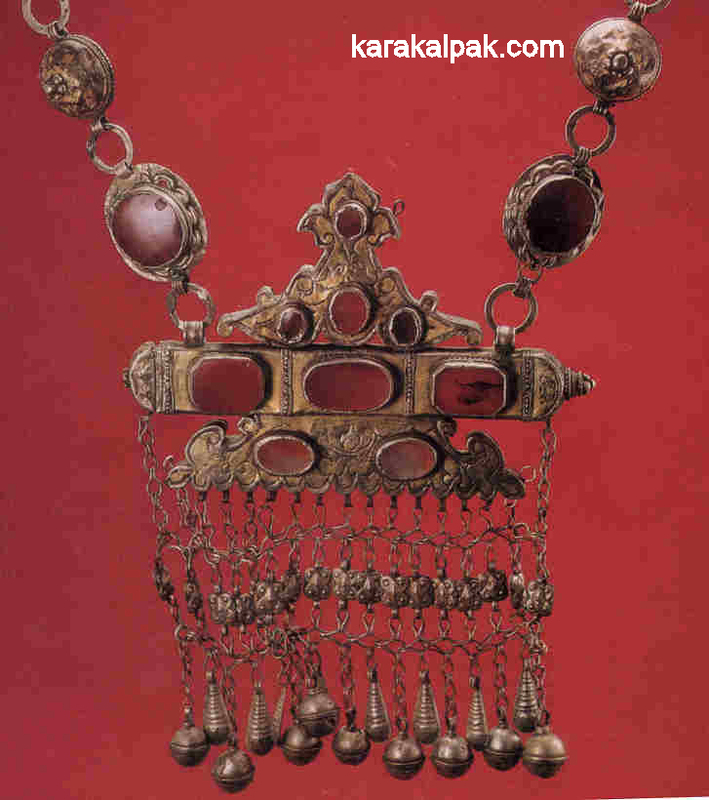 The Karakalpaks wore them in their ears but the Qazaqs wore them at the temples, either attached to their hair or to some form of headwear. 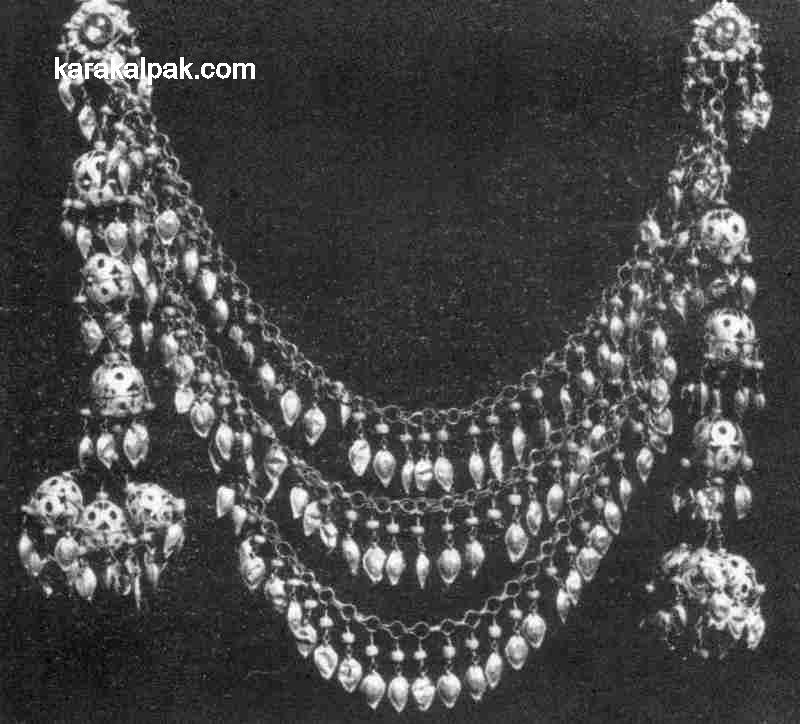 Very few Karakalpak women had a necklace within their collection of jewellery. 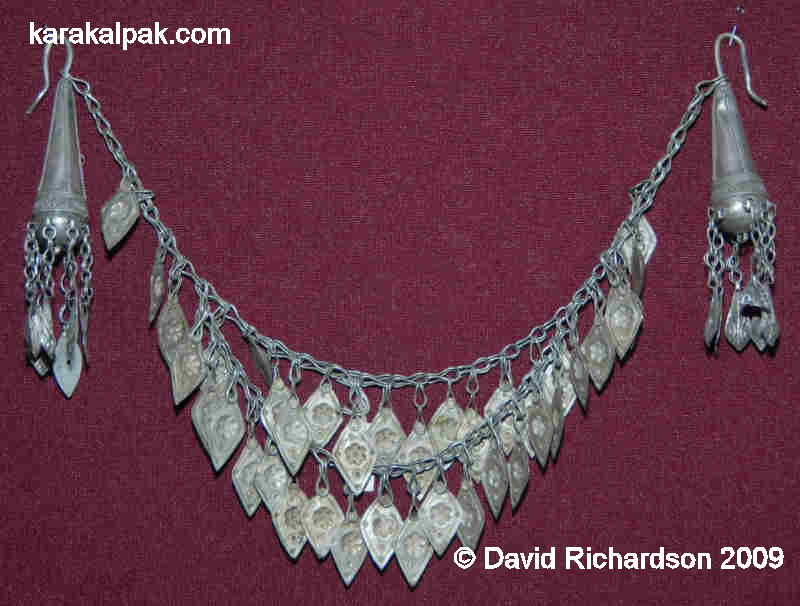 Necklaces were generally seen to be an Uzbek fashion. Women questioned by Morozova said that in the past Karakalpak women did not wear silver necklaces. However women in Shımbay and in the southern regions of Karakalpakstan bought necklaces in the Khivan style made of silver and gilded chains with turquoise and various pendants. 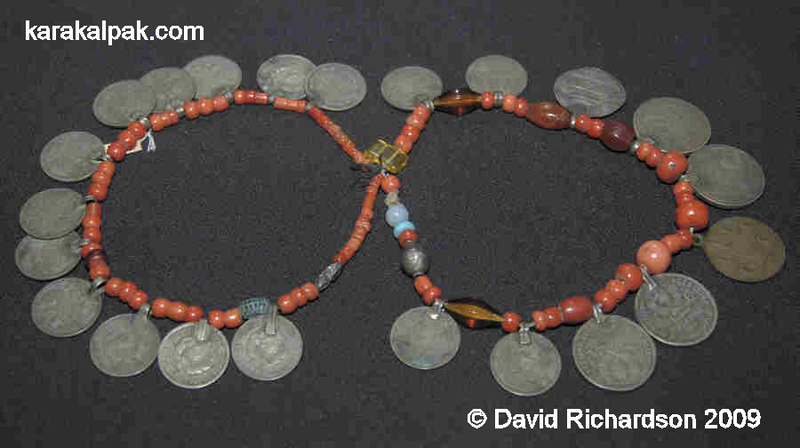 In some rural areas necklaces of coins known as xan-ten'ge or necklaces of coral could be seen. Necklace with a variety of coins, coral and beads. Coral necklace with a silver clasp. Both images courtesy of the Karakalpak State Museum of Art named after Savitsky, No'kis. Morozova recorded how in the decade following the Great Patriotic War a new type of necklace had become fashionable among Karakalpak women. Called a tamaq-qatar it was shaped like a dog collar and patterned with black and white glass beads threaded onto rows of thick silk. 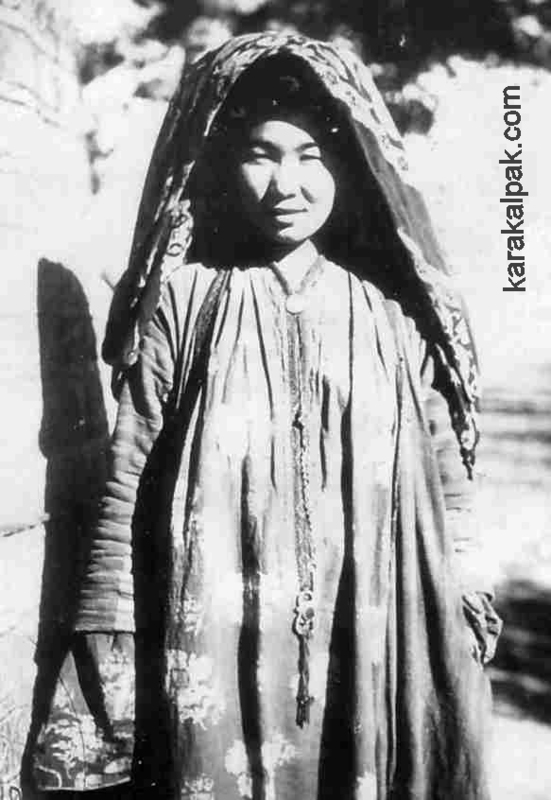 It seems to have been adopted from the Uzbek women living north of Khanki in the northern part of the Khorezm oasis. The word ay means moon in Karakalpak and often features in the traditional names of Karakalpaks, especially those of females (Aygu'l, Ayjamal, Aynagu'l, etc.). Cult beliefs linked the moon with fertility so it is perhaps not surprising to find a piece of female jewellery named after the moon. Ayshıq were generally made of silver, a metal traditionally associated with the moon, and often had a central mount of carnelian or coloured glass. They are usually 7 to 9 centimetres in diameter. They were worn either as a brooch or as the neck fastening for a dress collar. Two different ayshıq from the Regional Studies Museum, No'kis. The one on the left has writing engraved onto the carnelian while the one on the right is made of four coins soldered together. The most important piece of jewellery for a bride was the ha'ykel � see below. However, if her family was unable to afford this then she wore an ayshıq and a shartu'yme. If they could not afford both, then she wore just an ayshıq. The Karakalpak o'n'irshe was basically an embroidered textile breastplate made from the red woollen felted cloth known as qızıl ushıga. Sometimes the design included borders of qara ushıga and all of the outside edges were finished with raspberry red jiyek. A variety of decorative adornments were sewn onto this breastplate, such as metal platelets, coins, several types of tu'yme and the giltshalg'ısh. It was worn by unmarried girls of marriageable age. 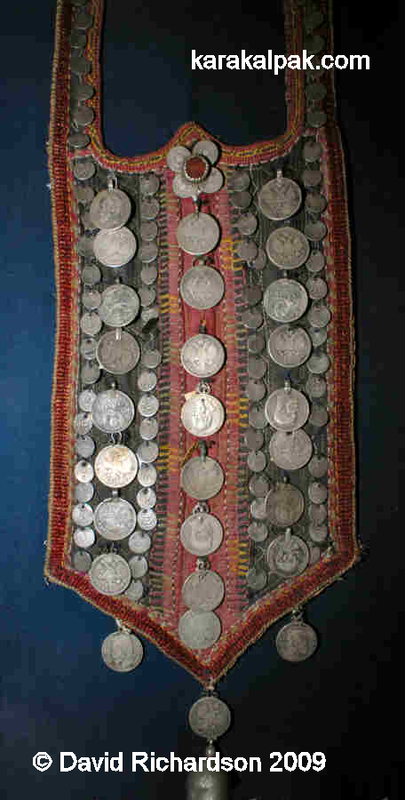 An unmarried girl's o'n'irshe, decorated with late 19th century coins, an ayshıq and a tu'yme. The o'n'irshe is actually a piece of clothing and we intend to devote a separate webpage to it at a later stage. However it is necessary to include this short description here in order to place the use of certain other jewellery items in their context. Tu'yme are brooch-like items of jewellery frequently incorporated into breast decorations. 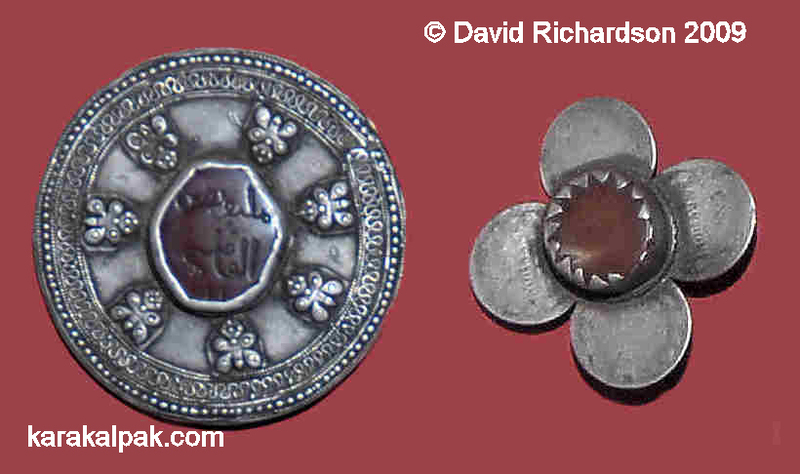 The word tu'yme on its own means button or small jewelled brooch. Xojamet Esbergenov believes that the different types of tu'yme were originally connected with different clan-tribal groups. 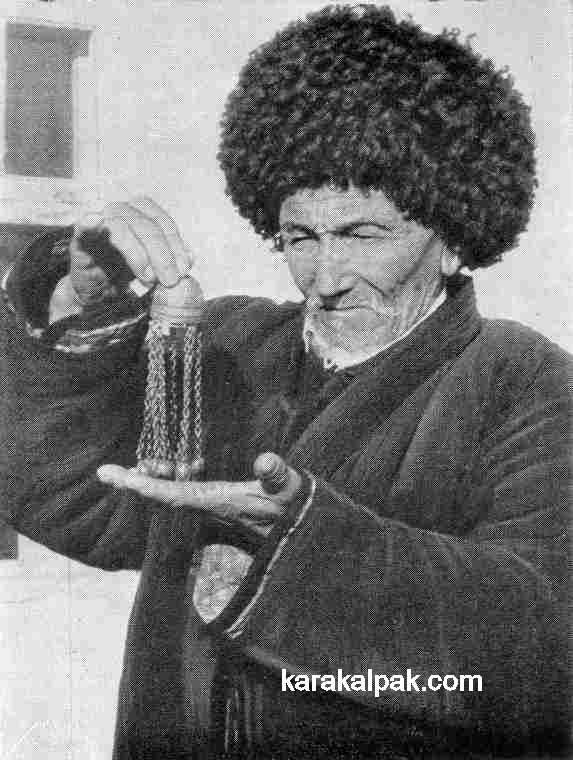 Elderly people questioned by Esbergenov informed him that the jumalaq tu'yme was characteristic of the Qon'ırat arıs and that this egg-shaped adornment symbolized the cult of the predatory bird or eagle. They also said that the baqa (frog) tu'yme was characteristic of the On To'rt Urıw arıs, whose economy was far more dependent on artificial irrigation. We have been able to identify eleven jewellers who made tu'yme, but unfortunately in the case of two of them the type of tu'yme that they made is not known. Of the remaining nine, one jeweller is from the On To'rt Urıw arıs and he did in fact make baqa tu'yme. The other eight are from the Qon'ırat arıs and made jumalaq tu'yme. However of these eight zergers three made baqa tu'yme as well as jumalaq tu'yme. It may be that some of them took commissions from both tribal divisions. Jumalaq tu'yme had two uses. The first was as a decoration sewn onto an o'n'irshe. The second was as a large button-like fastening for a dress collar. This tu'yme was a hollow sphere or ovoid, usually made from silver, and often decorated with a band around the centre. The ornamentation on either side of this band was generally of a floral nature. A selection of jumalaq tu'yme from the Savitsky Museum, No�kis. 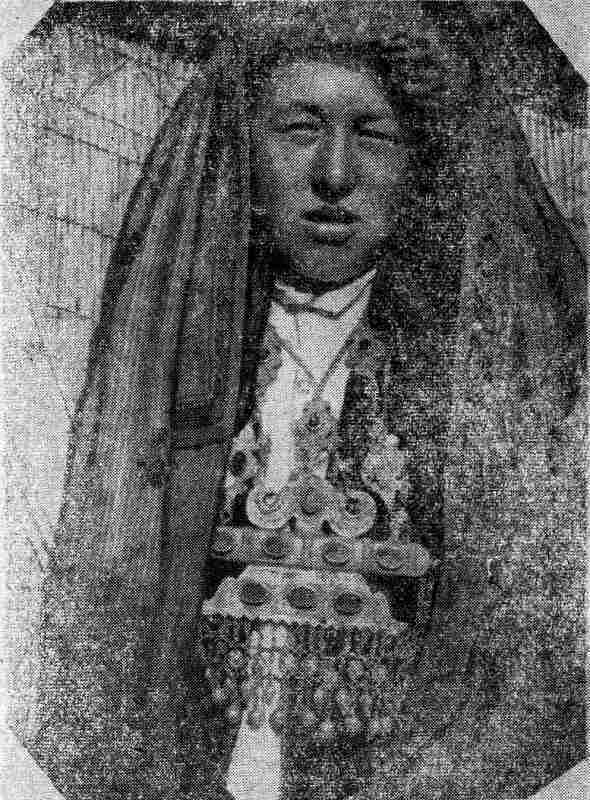 Zbay Doshanova from Telman kolxoz Shımbay region wearing a jumalaq tu'yme in the late 1930s. She too was a Stakhanovite, having picked 120kg of cotton in one day. Both of the names given to this type of tu'yme are somewhat confusing. The word jalpaq simply means flat and would therefore suggest a flat platelet but in fact the basic part of the tu'yme has a depth of one centimetre with an additional half centimetre for the mounted stone. The word baqa, sometimes spelt qurbaqa, means frog or toad in Karakalpak. Two examples of baqa tu'yme from the Regional Studies museum, No'kis. "In some breastplates the shape of the 'boka�tuyme' was absolutely identical to the shape of the carpet medallion called 'Karakalpak-nuska' � 'the Karakalpak pattern' by Fergana carpet makers." We have been unable to find any examples of baqa tu'yme that resemble the 'Karakalpak nuska' and wonder if there may have been some confusion with the shartu'yme which does have some similarities to it. O'temisov shows a set of moulds or qa'lip for casting baqa tu'yme. However most examples that we have encountered are hollow and appear to have been assembled from flat sheets of silver. A set of moulds for casting baqa tu'yme that belonged to hereditary master-jeweller Qoraz Tilewbayev (1848-1919). Image from Plate 42, Ethnography of the Karakalpaks by Zhdanko, Esbergenov and O'temisov. It is interesting that Qoraz Tilewbayev's moulds are for baqa tu'yme, which were supposedly preferred by by the On To'rt Urıw. However he was from the Uyg'ır tribe, part of the Qon'ırat arıs who supposedly favoured the jumalaq tu'yme. 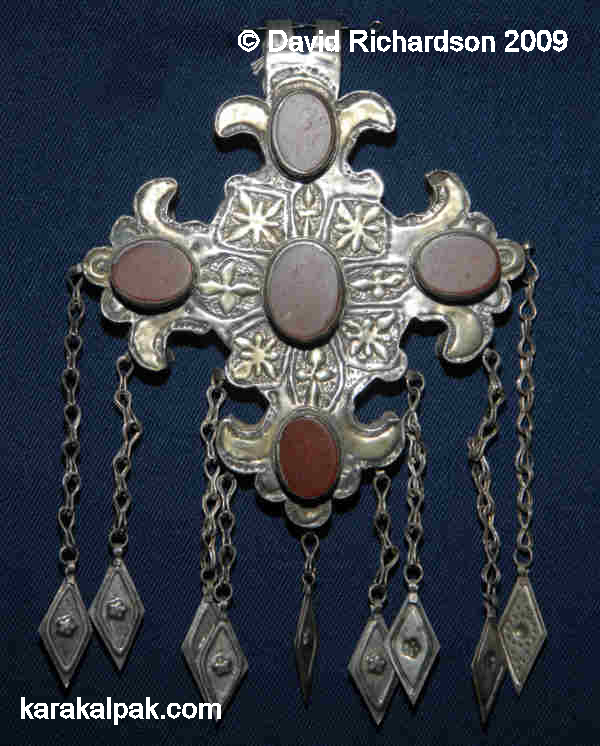 Shartu'yme were large cross-shaped breast decorations with mounted stones, usually of carnelian or coloured glass. Confusingly the word shar refers to a ball or sphere. Xojamet Esbergenov has argued that the four arms of the shartu'yme relate to the four cardinal directions and that the sharta'rep (spherical directions) are therefore the four directions of the world. We remain sceptical. Karakalpak shartu'yme with a rather crude punch decorated face. There remains some confusion regarding the manner in which shartu'yme were worn. Esbergenov believes that when a family could not afford a ha'ykel the shartu'yme was worn as a less expensive substitute. Consequently the shartu'yme and the ha'ykel were never worn together. However Ag'ınbay Allamuratov wrote that two shartu'yme were sometimes fastened to the bottom edges of the ha'ykel. Aygu'l Pirnazarova, the Curator of Costume and Jewellery at the Savitsky Museum, recalls a man who used to collect material for the museum. He discovered a ha'ykel with two shartu'yme attached to the sides of its bottom edge, now held in the reserve collection. He emphasized that it would be a great sin to separate this ensemble. However this seems to be a unique example and one in which the shartu'yme appear to have been added later in a rather amateurish fashion. It remains the only solid proof that shartu'yme were worn with the ha'ykel. Nevertheless Aygu'l adds that she has shown this combination to many local people and none has so far indicated that the arrangement was incorrect. An elegant gilded shartu'yme. The turquoise stones that originally surrounded the central carnelian are missing. Perhaps the truth lies somewhere in between. Allamuratov was very knowledgeable and it would be foolish to dismiss his comments. It is likely that a small minority of very wealthy Karakalpaks could embellish a ha'ykel with two additional shartu'yme for an elaborate wedding display. However in the majority of cases it is likely that the shartu'yme was primarily used as an independent item of jewellery. 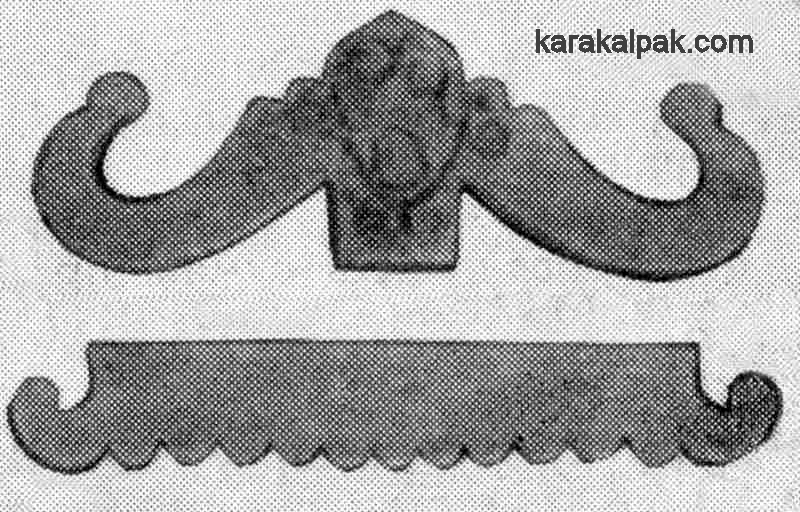 One wonders whether the Karakalpak shartu'yme, like the ha'ykel breast decoration discussed below, has connections to the Volga region of Russia. It is interesting that the Chuvash also have a breast decoration known as a shulgeme. Another avenue we have yet to explore is whether there is any connection with the Christian cross - the shape of the shartu'yme has similarities to that of the medieval four-ended baptismal cross used by members of the Russian Orthodox church. 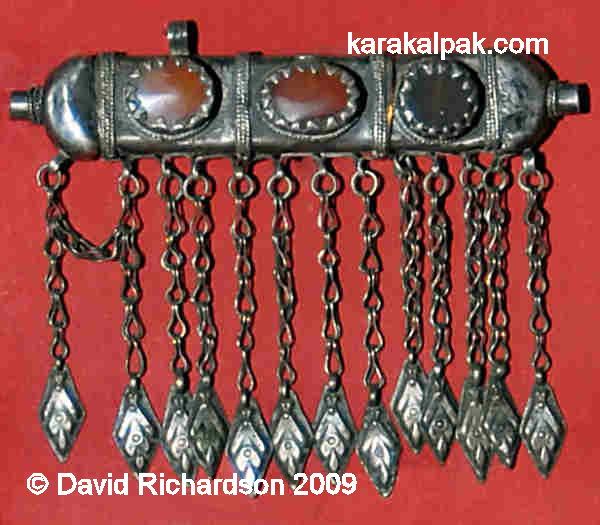 Apart from the sa'wkele, the ha'ykel is probably the most impressive single item of Karakalpak jewellery. It is a breast decoration, generally of silver and sometimes gilded, with carnelian or coloured glass inserts. A Karakalpak woman wearing a dramatic ha'ykel along with an oramal and a jipek jegde. Photographed by ethnographers from the Khorezm Expedition in Qon'ırat region, 1946. From the age of 12 to 14 upwards, young girls wore the qız ha'ykel which was much simpler than the adult version but based on the same layout. It was also smaller with the width of the eight examples in the Savitsky reserve collection ranging from 10½ to 13½ centimetres. However within the collection of the Savitsky Museum there is only one qız ha'ykel for every 19 ha'ykel, suggesting that these were far less common. When she was ready to get married the bride-to-be passed on her qız ha'ykel to her younger sister and her father commissioned an adult ha'ykel from a zerger. This was the foremost item in the jewellery set of the bride. A stunning ha'ykel with five tu'yme, presumably commissioned by a wealthy Karakalpak. The ha'ykel was put on by the bride at the very start of the wedding ceremony, when she was dressed in her own home before she moved away to the house of the groom. She continued to wear the ha'ykel for festivals and family celebrations up to the birth of her first child and sometimes up to the age of 40. It was no longer worn once she had passed the age of childbearing. The main component parts of the Karakalpak ha'ykel. The front face is decorated with an engraved or chased pattern and is sometimes gilded. The middle section or tumarsha is in three parts � a long tube for holding prayers and two end caps (one soldered and one removable). 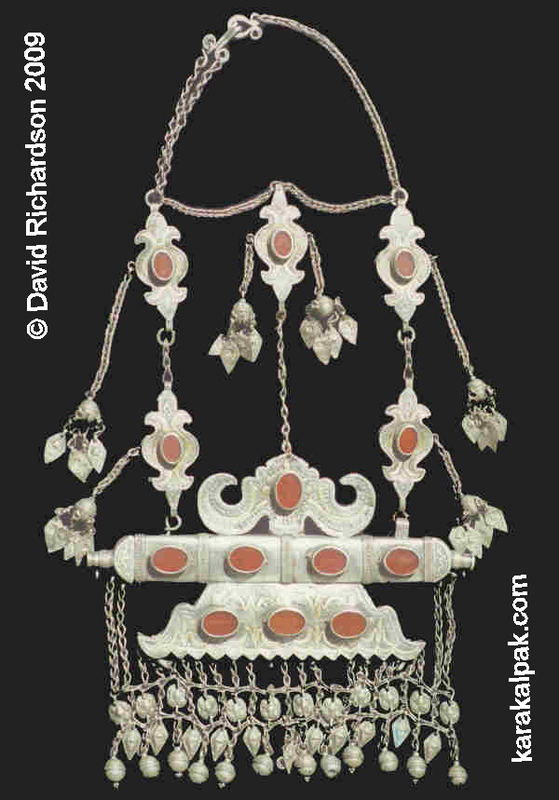 It has from three to five high mounts with carnelian or red glass inserts. 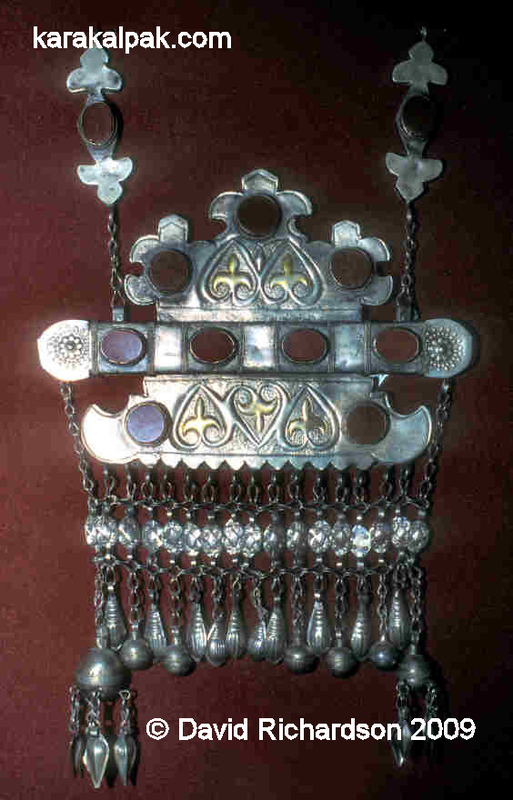 The mounts are divided by vertical bands of filigree. There are often loops on this section for the attachment of a chain or fabric strap decorated with metal platelets. The part below the tumarsha takes the form of horns or scrolls. Sometimes the lower sections have stone or red glass mounts but not in all cases. 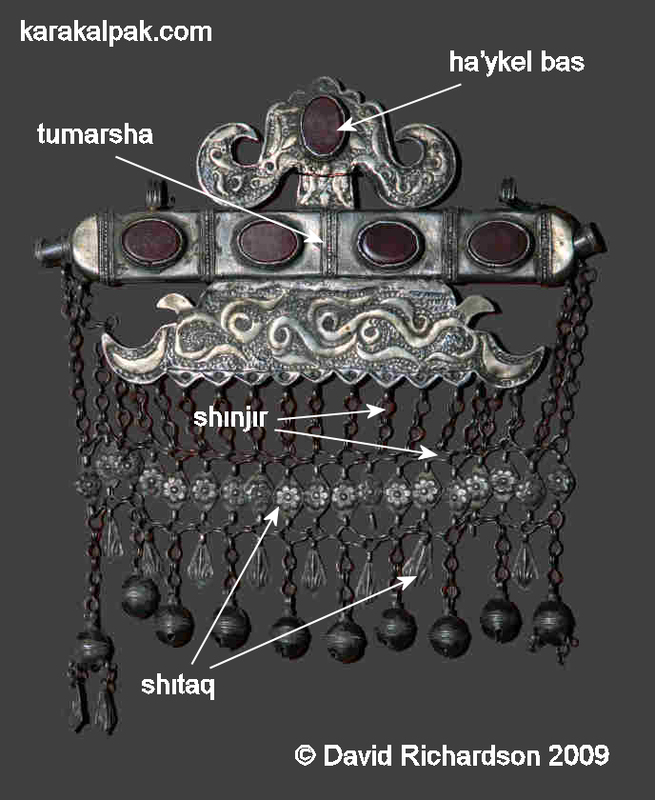 These lower sections have a fringe (shashaq) of chains (shınjır), decorated platelets (shıtaq) and sometimes bells. Two shartu'yme are sometimes fastened to the bottom edges of the ha'ykel. We have tried to find out if there is any significance in the number of stones used on the ha'ykel and have been given two different (but not incompatible) answers. The first is that the number was related to fertility, the greater the number of stones used the greater the number of children you desired. The second is that the stones were expensive and were therefore an indication of wealth. Obviously the wealthier you were the larger the family you could support. However it is just as likely that these are more recent interpretations and that the number of stones used was just part of a particular artistic canon. It is interesting that all of the examples of the so-called Mu'yten type that we have seen have six stones, suggesting a level of consistency within a specific design rather than a link to fertility. Allamuratov gives a figure of three to five stones on the tumarsha of the ha'ykel. We have analysed 30 traditional ha'ykels to date and have noted nine examples with three stones and twenty-one with four stones but have not seen any examples with five stones. The only ha'ykel we are aware of with five stones belonged to the late Ayımxan Shamuratova, a popular Karakalpak singer, dancer and actress who died in 1993. Her ha'ykel must have been made in the 1930s. Today modern garish versions of the Karakalpak ha'ykel are manufactured in Ashgabat for Karakalpak dance troupes and actresses, but even these seem to limit the number of stones on the tumarsha to four. The overall number of stones on the ha'ykels we have examined ranges from four to twelve with the majority of examples (ten out of thirty) having eight. Let us now examine the four different types of ha'ykel listed by Allamuratov, according to the design of their ha'ykel bas. We will begin with the two types of ha'ykel that are decorated with a pair of curled horns. Allamuratov linked the use of horns (mu'yiz) on ha'ykels with the agrarian cult of the bull and ideas about the fertility and prosperity of the family. He noted that in Russia horned kichka headdresses were worn by young women who changed them for hornless ones in old age. In the same way Karakalpak women stopped wearing the horned ha'ykel when they were past the age of childbearing. Type I ha'ykel with upturned horns. It was commissioned for the wedding of Sadegu'l in the 1910s. Private collection, No'kis. The majority of the ha'ykels that we have seen are of this horned style. An indication of the cost of the ha'ykel can be gained from the example shown above. Sadegu'l from the Qarasıraq clan was born in 1895 in Qarasıyraq awıl in the Kegeyli region. It is believed that she was married sometime between 1910 and 1920. For her wedding her father commissioned a ha'ykel the price of which was one cow. Type II ha'ykel with downturned horns. Note how the style of the bottom reflects the top giving a feeling of symmetry. Allamuratov did not explain why the bull should have been an important component part of some ha'ykels and not of others. Nor did he try to link the ha'ykel with horns to any specific clan-tribal group. Type III ha'ykel with three separate figures ending in trefoils or ram's heads. Savitsky thought that some characteristics of this type of ha'ykel were tribe-specific. The example above was believed to be typical of the Mu'yten tribe, cattle-breeders who formerly inhabited the southern shores and islands of the Aral Sea. The top ends of the ha'ykel bas, which Allamuratov interpreted as trefoils, were interpreted by Savitsky as stylized ram's heads. To complicate matters further, an elderly Karakalpak man informed the Savitsky Museum that his grandfather (a Mu'yten) had told him that they represented three anthropomorphic figures sitting down. Alas we are dealing with conflicting opinions and not facts. Type IV ha'ykel, an unusual style also possibly associated with the Mu'yten tribe. Note the use of trefoils both above and below the tumarsha. Image courtesy of the Regional Studies Museum, No'kis. The ha'ykel was definitely viewed as amuletic, protecting the wearer from misfortune and the evil eye. Items found inside some ha'ykels included very old pieces of textile, threads with knots, salt, and paper inscribed with prayers. A very unusual type V ha'ykel with a triple trefoil design. The example of the narrowing trefoil design given above has a very bold pattern engraved on the face. The addition of two more decorations on the chain is unusual. It has some similarities to the ha'ykel shown by Johannes Kalter in Heirs to the Silk Road. The second type V ha'ykel has another boldly decorated face. In this case the trefoils are more horn-like, the two lateral trefoils being partly integrated within the ha'ykel bas. A second type V ha'ykel with horn-like trefoils. One further feature of ha'ykels is the variation in their quality of manufacture, ranging from crude to sophisticated. A very sophisticated ha'ykel with another unusual ha'ykel bas. The fabulous chain with mounted stones shows it must have been made for a very wealthy person. Image from Savitsky's Album of the Karakalpak State Museum of Art, No'kis. Ha'ykels were made using stamps and moulds. Moulds used for making ha'ykel parts. Ethnography Fund of the Institute of History, Language and Literature, Karakalpak Branch of the Uzbek Academy of Sciences. These moulds belonged to the hereditary master-jeweller Qoraz Tilewbayev (1848-1919) and were found in the State farm named after A. Musaev, in the Shomanay region, in 1974. Some have suggested that the base of this style of ha'ykel is representative of the crenulated walls of a qala. Compare these ha'ykel component parts with the moulds above. 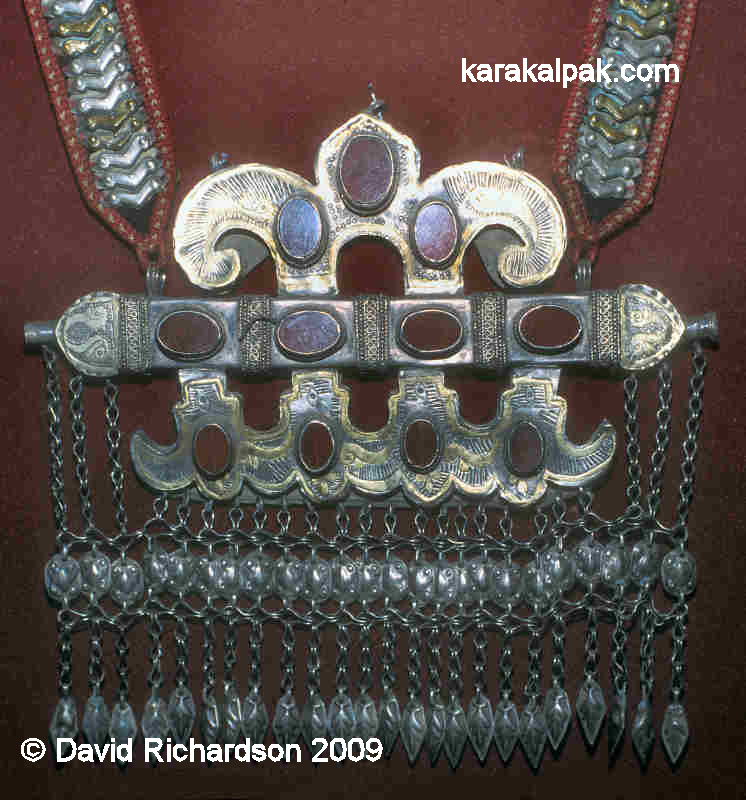 Ha'ykel-like pectoral decorations are not restricted to the Karakalpaks. Allamuratov observed that similar items were worn by the Turkmen, Uzbeks, and Tajiks of Central Asia and by the Bashkirs, Udmurts, Mordvin, and Chuvash of the Volga region of Russia. 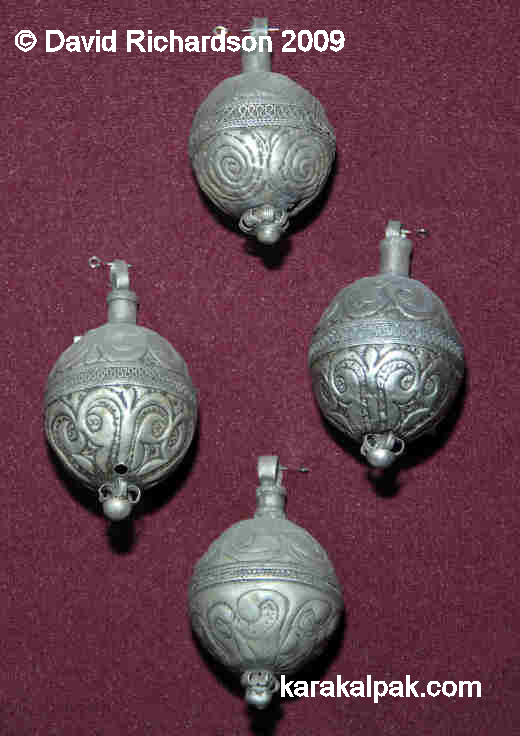 For example the Bashkirs wore a semi-oval breast decoration decorated with silver plates, carnelians and small bells. It was called a hakel. 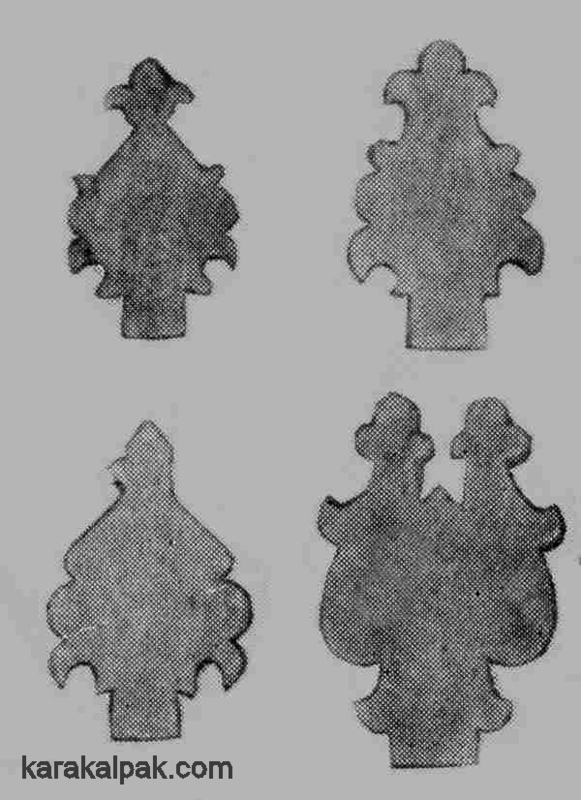 Although the Qazaqs wore the small tu'marsha triangular amulets and the larger composite boi tu'mar, both differed significantly from the Karakalpak ha'ykel. 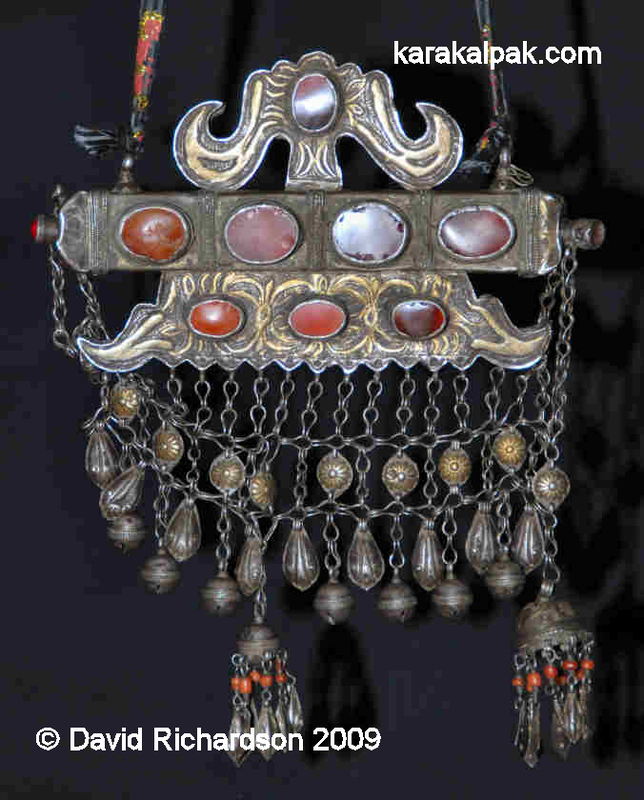 The distribution of such decorative hangings among the peoples of the Volga and their absence among the Qazaqs, Kyrgyz, and Tatars of Eastern Turkestan might indicate a point of origin in the Volga region � as with the sa'wkele headdress. Within Central Asia only the Turkmen seem to have an analogous item of jewellery, found among the Tekke and Ersari. This has a very similar shape to the Karakalpak ha'ykel. Does this indicate that it was influenced by the Karakalpaks? A Tekke Turkmen tumar, late 19th or early 20th century. From Medzhitova et al. Possibly not, since the Turkmen nomenclature is quite different. 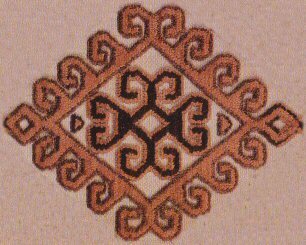 Turkmen refer to their ha'ykel-like decoration as a tumar, whereas the Karakalpaks use the term tumar to denote the middle horizontal tube of the ha'ykel. The item known as a kheykel' by the Turkmen is very different. It has the shape of a small box, is often of leather, and is trimmed with silver platelets. Tekke Turkmen kheykel', late 19th or early 20th century. Silver, gilding, carnelian, leather, engraving. According to Kate Fitz Gibbon these 'leather envelopes' were used by old women. She believes they contained prayers or keys rather than a copy of the Qu'ran as has been suggested by some writers. 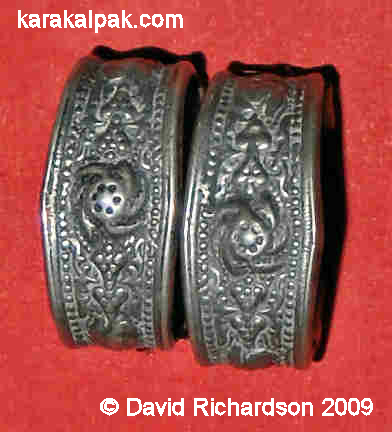 In Karakalpak jewellery a tumar is a small plain hollow silver tube. If it has inserts of stones or coloured glass it is called a tumarsha. Larger examples were worn on chains around the neck while smaller ones were sewn onto clothing. They were worn by children and young women. They were believed to have amuletic properties and were sewn onto the back of children�s clothing. Leaves, plants, and a piece of paper with a prayer written onto it were packed inside the tube of the tumar as 'protection'. A tumarsha above and a tumar below from the Regional Studies Museum, No'kis. Researchers in 1948 found that the style in women's jewellery was changing rapidly and that by the end of the 1930s the tumar amulets had become much smaller. The fashion was for the new gilded tumars with turquoise inserts. The word tumar is now also used to apply to a piece of textile made into a bag, with various protective elements inside it such as bread, salt, and onion skin. 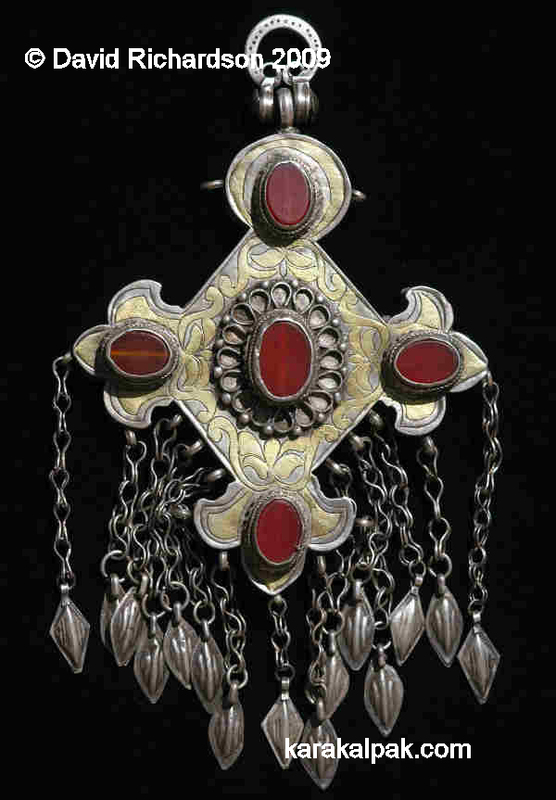 A Tekke Turkmen silver tumar with carnelian, late 19th or early 20th century. The Tekke tumar shown above seems to be something of a halfway house between a tumar and a ha'ykel. Image of a young Karakalpak girl wearing soyaw sırg'a and a tumarsha. This is a pendant for a key (gilt) and is occasionally referred to as an anshıq. It has the shape of a double loop, interpreted by Alieva as a stylized female figure, and usually has a stone or coloured glass insert. The examples that we have seen range from 6 to 9 centimetres in height. The metal used varies, some are of silver and some are bronze. Left: Giltshalg'ısh with keys from the Regional Studies Museum, No'kis. 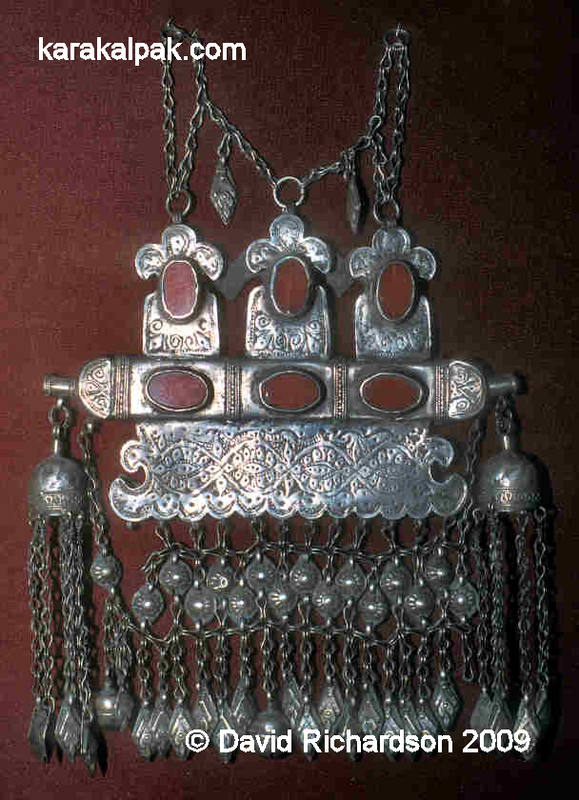 Right: Giltshalg'ısh with pendants of small bells from the Savitsky Museum, No'kis. 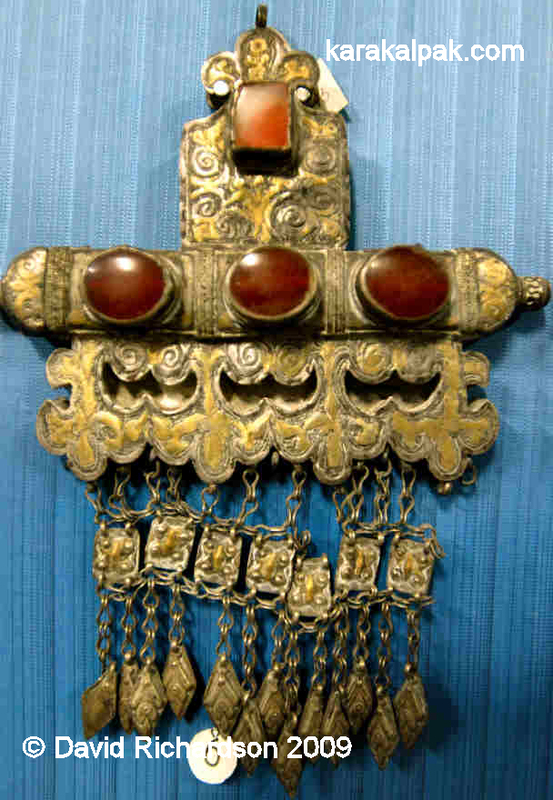 For everyday wear the giltshalg'ısh was hung around the neck and then the keys were suspended from it. Young woman photographed by Melkov in 1928 wearing a giltshalg'ısh and keys. However on festive occasions the giltshalg'ısh was sewn onto the tapered end of the o'n'irshe and an o'n'irmonshaq was hung from it. See the following section. As previously stated the o'n'irmonshaq was considered to be one of the essential parts of a bride's set of jewellery. It is a symbol of motherhood, worn just below the navel. Its shape is said to resemble the cupola of mosques and mazars, but this may be a recent interpretation. The top section is generally engraved and often gilded. Some examples are inset with small stones such as turquoise and coral. Below the hemisphere is a circle with an ornamental fringe (shashaq) of dozens of small lengths of chain, each terminating in a small decoration such as a stamped leaf or a bell. An o'n'irmonshaq from the Savitsky Museum has a metal toothpick attached to one of the chains. O'n'irmonshaq attached to a giltshalg'ısh. Regional Studies Museum, No'kis. The o'n'irmonshaq was hung from the giltshalg'ısh which in turn was stitched to the base of the o'n'irshe. Only the top part of the o'n'irshe was attached to the clothing. Morozova explains how this meant that the o'n'irmonshaq moved freely, making a pleasant sound which was reflected in a folk song about 'ringing girls'. O'n'irmonshaq commissioned for the wedding of Sadegu'l in the 1910s. Private collection, No'kis. O'n'irmonshaq were a costly item of jewellery. Sadegu'l from the Qarasıraq clan was born in 1895 in Qarasıyraq awıl in the Kegeyli region. It is believed that she was married sometime between 1910 and 1920. For her wedding her father commissioned an o'n'irmonshaq the price of which was 1 cow. Full set of jewellery for a Karakalpak bride including an o'n'irmonshaq and a ha'ykel. For the wedding of a bride from a wealthy Karakalpak family the o'n'irmonshaq was hung from the giltshalg'ısh and worn in combination with the ha'ykel. 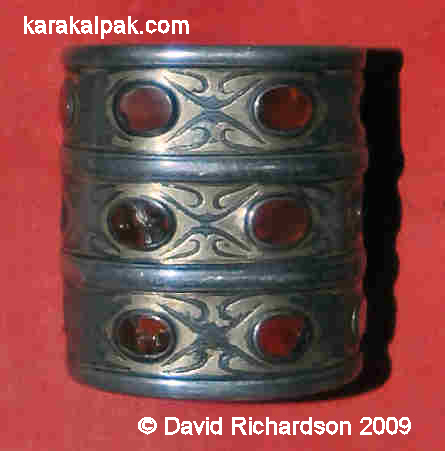 The Karakalpak word for bracelet is bilezik. 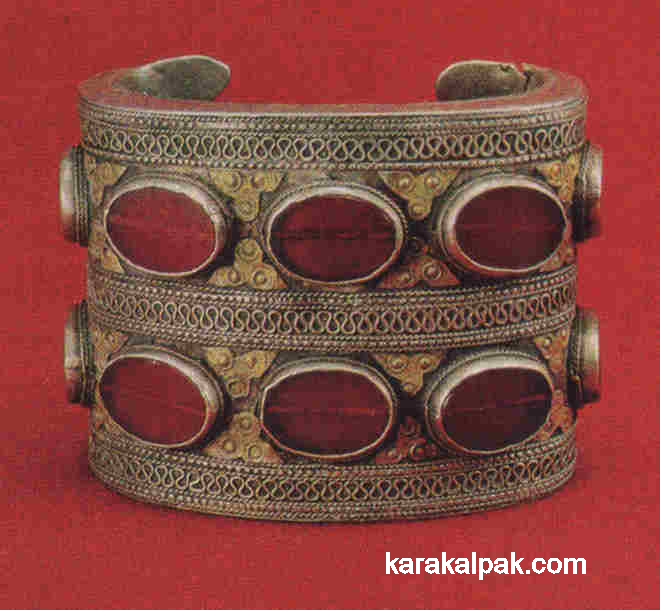 Many Karakalpak bracelets have close similarities to those of the neighbouring Qazaqs and Turkmen. There is some confusion over which bracelets were worn by which groups. Some of the elderly informants questioned in the 1970s asserted that bracelets were not part of the jewellery set of girls as they were a symbol of the faithfulness and honesty of wives. Describing the role of jewellery in courtship, Zafara Alieva explains how the bride's parents gave a gift of nine items (togızlıq) to the matchmakers. The first of these was a silver bracelet and this signified that the girl was now betrothed. She also states that the bride first put on adornments in the shape of a ring (i.e. rings and bracelets) on her wedding day as these were symbols of matrimonial fidelity. However, according to O'temisov, girls bracelets were narrow and were worn from the age of 12 up to marriage. It is likely that there were strict rules in the past and that these changed over time. 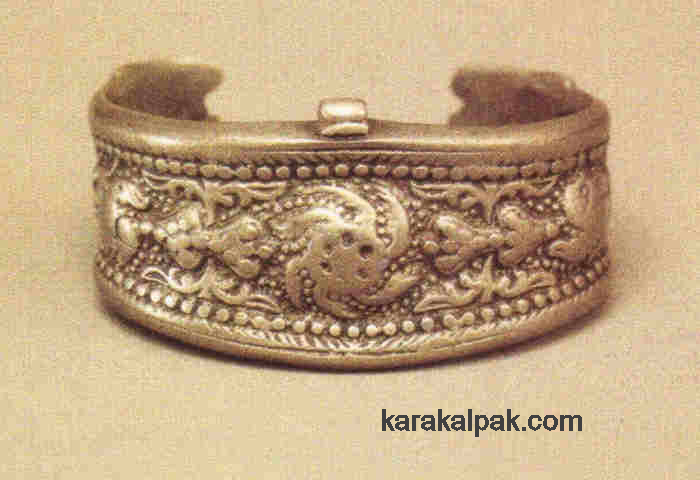 This is a flat, patterned bracelet made of silver or of melted down Khivan silver coins (xan-ten'ge). A jalpaq bilezik with punch decorated sides from the Richardson Collection. Aygu'l Pirnazarova of the Savitsky Museum believes that these were worn by young girls. However Morozova states that they were worn by women from rural areas. Quyma means cast or moulded. These bracelets were made of copper or silver and had either 8-12 stones or a relief pattern on them. They were worn by a girl during her wedding. Pair of quyma bilezik with a central solar motif from the Regional Studies Museum, No'kis. Nineteenth century bilezik from East Kazakhstan. Central State Museum of the Qazaq SSR. 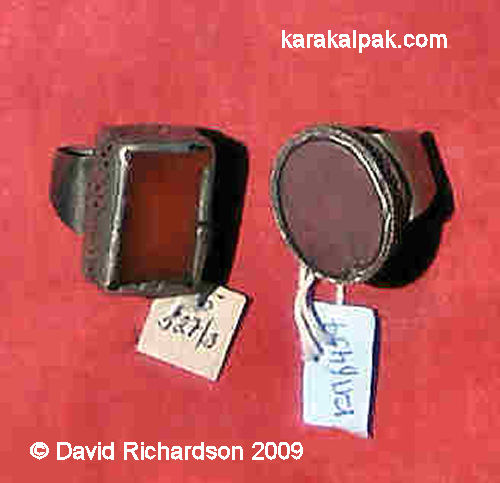 The similarity between the Qazaq and Karakalpak bracelets shown above is striking. Sometimes the quyma bilezik have lots of tiny turquoise beads inserted into shallow depressions and then they are known as piruza (turquoise) qaslı (stone) bilezik (bracelet). The stones are missing on the vast majority of these that survive. It looks as though the quyma bilezik above once had 6 small stones mounted in the centre of each bracelet. Literally bracelet with stones. These are similar to one of the types of Turkmen bilezik. The main difference lies in the greater use of silver, sometimes with a small amount of gilding. A heavy Turkmen-like qaslı bilezik. Qaslı bilezik from the Regional Studies Museum, No'kis. These bracelets were typically worn by a young married woman. The ends of these bracelets resemble a row of teeth. Jez is the Karakalpak word for brass. On her wedding day the bride gave out gifts, including jewellery, to women in her new awıl. These included gifts of jez bilezik to old women. These bracelets, which had ends in the shape of teeth, animal paws or snakes were not worn but kept safe. They symbolized the union of the totems of the clans of the bride and groom. This was bronze, patterned or with stones and made like the jalpaq bilezik. "...on their hands are copper and silver bracelets with poor turquoise or jasper." The first image that we have available to us is the following photograph taken by the Swiss explorer Ella Maillart of her Karakalpak companions in 1932. 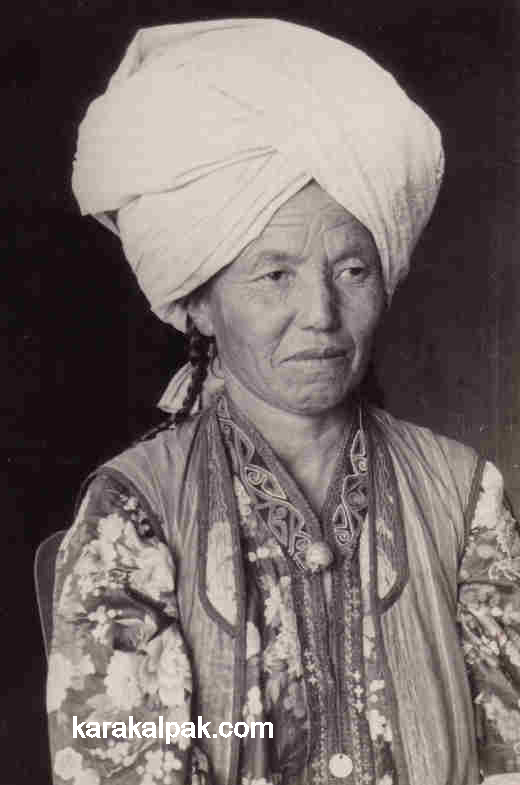 Karakalpak married woman wearing qaslı bilezik. Photographed by Ella Maillart at Kopalik, near Khiva, in 1932. We can see that the lady is wearing a pair of qaslı bilezik. 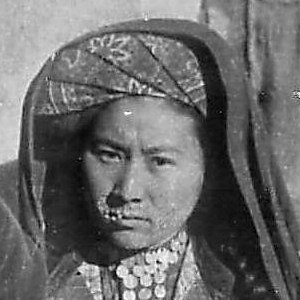 Although there are other images of Karakalpak women wearing jewellery their arms are usually covered by the very long sleeves of their clothing and so it is impossible to see any bracelets. Qaslı ju'zik. This is a ring with a mounted 'stone', usually carnelian though sometimes of coloured glass. It was worn by young women and married women. Qus tu'msıq ju'zik. A ring shaped like a bird's beak also worn by young women and married women. 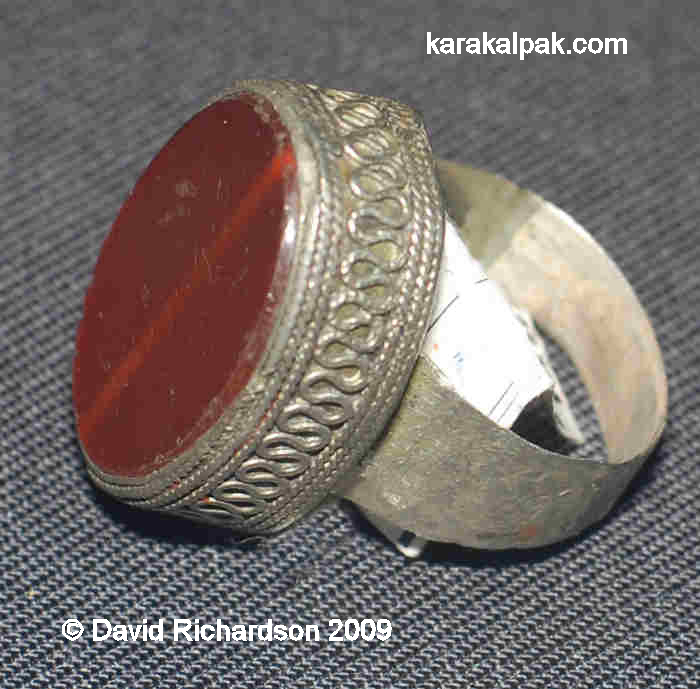 The Qazaqs have a ring with the same name but it is worn by young men. Mo'r ju'zik. This polished ring is a man's seal or signet ring. Saqıyna ju'zik. There are differences of opinion concerning this type of ring. Morozova describes them as a flat silver rings with a chased pattern. But the Karakalpak Glossary of Artistic Crafts implies that they had a stone mounting. Do'n'gelek ju'zik. This is a disk-shaped ring. Two rings from the collection of the Regional Studies Museum, No'kis. A ring from the Savitsky Museum, No'kis. 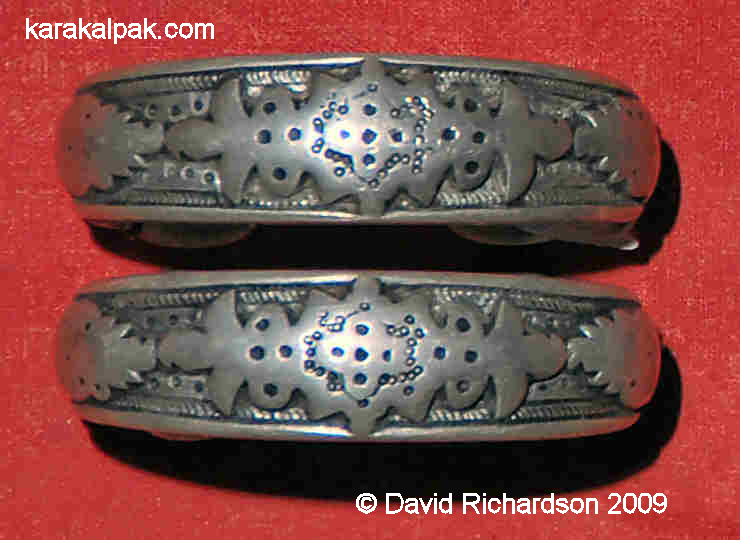 According to O'temisov, one of the characteristic features of Central Asian rings were their high mounts. This was due to the fact that they were made from wire flattened by blows from a hammer. Karakalpak jewellers were known as zergers - a Turkic word derived from the Persian zar meaning gold. They mainly manufactured women's jewellery articles, but also men's belts and silver decorations for horse saddles and tack. 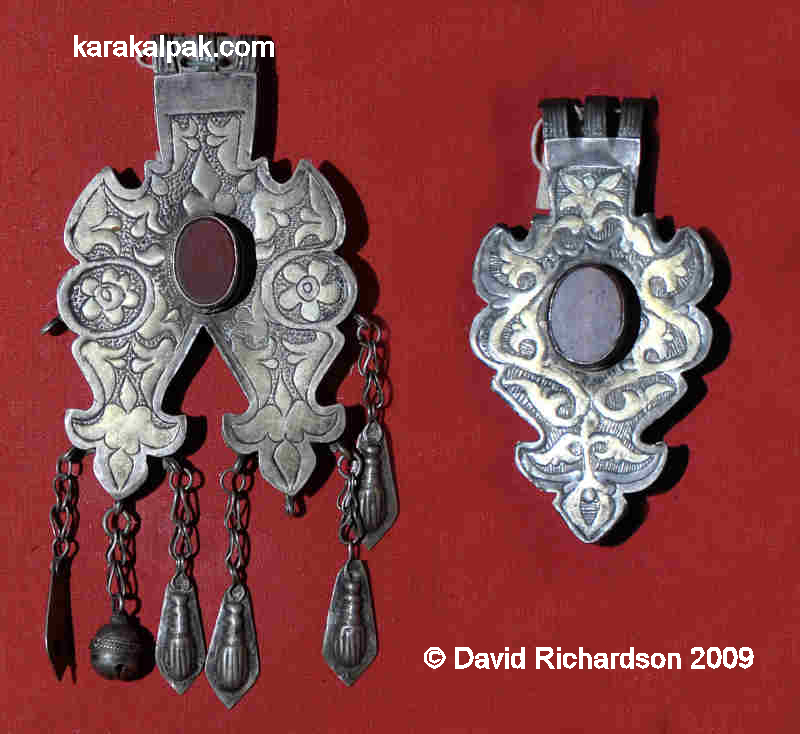 Some Karakalpak zergers were only involved in making jewellery but some doubled up as blacksmiths as well. At the end of the 19th to the beginning of the 20th century there was a zerger working in almost every large village throughout the delta. Many usually also worked in the adjacent smaller villages. Sometimes jewellers worked in their own homes and sometimes in the homes of their customers. They were generally paid with grain or cattle, less frequently with money. Occasionally they received silver as payment, which they presumably reused. Some jewellers who made the more expensive goods were relatively well off, owning land and cattle, such as Oraz zerger who was listed in the Khivan Khan's archives of 1869-1872 as owning 75 head of cattle and 106 sheep. Others could not exist on their earnings from this trade and so were also involved with agriculture, fishing, and cattle-breeding. A'met zerger Nasırov from Taxta Ko'pir. 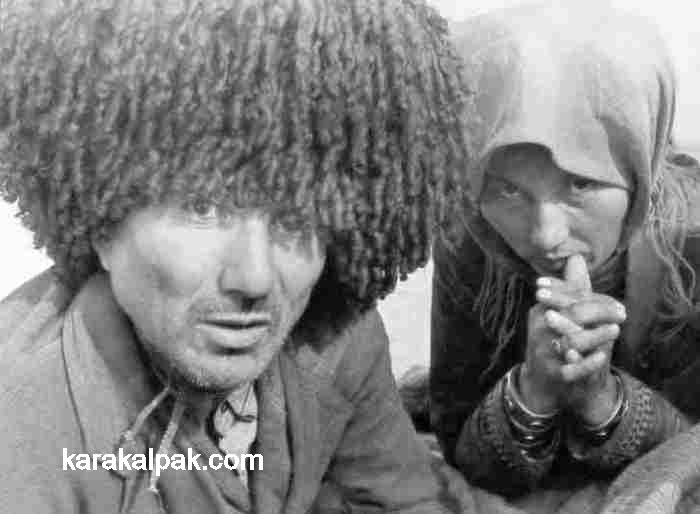 Image from Ethnography of the Karakalpaks by Zhdanko, Esbergenov and O'temisov. Jewellery making was a hereditary craft in which the masters generally trained either their own son, or a close relative, or failing that the son of another member of their clan. A hereditary jeweller was known as a shınjır zerger � literally 'jeweller chain'. Zergers belonged to craft guilds which had masters (usta) and apprentices (sha'kirt). They believed they were protected by a spirit (pir) called Ha'zireti Dawit. They followed a strict set of regulations known as risa'le. Innovation was discouraged � the apprentice was merely supposed to copy the work of the master. An apprentice could only become a master after many years of training � sometimes up to ten years. When he was judged to be ready he received the blessing (pa'tiya) of the master in front of the members of the guild. Another example is that of Xudaybergen zerger who came from eight generations of hereditary jewellers. He worked with his father, Qoraz, and grandfather, Tilewbay, in and around Shortanbay. He completed his apprenticeship at a young age and in 1902 began to work on his own at the age of 17. When collectivization occurred he began to work as a blacksmith while at the same time still making jewellery in his spare time. Arzımbet zerger of the Mu'yten tribe from Terbenbes Island on the shore of the Aral Sea was another jeweller who had been trained by his father. His son, Seytmurat, also went on to become a jeweller. Arzımbet was considered to be the most skilful jeweller in the area as shown by the fact that he made a sa'wkele � the pinnacle of Karakalpak jewellery art. Karakalpak zergers tended to produce a wide range of goods and, unlike the Bukharan jewellers at that time, did not specialize in particular items (see table further down). The majority of the jewellery made by the zergers was of a fairly uniform type. However Savitsky believed that there were some characteristics that were tribe-specific. For example the ha'ykels of Mu'yten jewellers tended to have the stylized image of three ram's heads on their upper part. We have tried to examine whether or not jewellers tended to come from a particular tribe or clan (with the obvious exception of the Zerger tiıre or sub-clan). Allamuratov lists some 79 jewellers and we have been able to ascertain a definite clan-tribal affiliation for 49 of them. With regards to the rest no affiliation is given for some of them and it is ambiguous for the rest � there are some clans with the same name that appear under different tribes. The table below shows these affiliations. There are 166 clan-tribal groups and sub-groups within the On To'rt Urıw arıs. We have been able to link 20 jewellers to this arıs. As can be seen above 9 are from the Qıtay U'lken Urıw (large clan, tribe), 6 from the Qıpshaq, 4 from the Man'g'ıt and 1 from the Keneges. There are 149 clan-tribal groups and sub-groups within the Qon'ırat arıs. We have been able to link 29 jewellers to this arıs. 15 of them come from the Shu'llik division (consisting of 112 groups) and 14 from the Jawıng'ır division (consisting of 37 groups). The tribe with the largest single number of zergers is the Uyg'ır with 6. It is striking that so many jewellers come from the relatively small Jawıng'ır division though obviously the fact that the profession of jeweller was a hereditary one plays a part in this. According to Alieva and Fakhretdinova, the centres of jewellery making in Karakalpakstan in the 19th century were Qon'ırat, Xojeli, To'rtku'l, Shımbay and Xalqabad. However the extensive list given by Allamuratov shows that the majority of jewellers were in the Kegeyli, Moynaq and Taxta Ko'pir regions. The names of some settlements reflected the trade carried out there � there is a village called Zerger about 55 km south of No'kis and another called Sırgalı (earrings) near Kegeyli. There is also a Karakalpak sub-clan called Zerger � part of the Qıtay tribe of the On To'rt Urıw arıs. Working in the early 1970s the Karakalpak researcher O'temisov tried to establish an accurate number of zergers who had worked in Karakalpakstan at the turn of the century but was unable to do so due to the lack of reliable sources. In the table below we have collated all of the data collected by Allamuratov as well as that given by Alieva and Fakhretdinova to present as full a picture as possible of the state of Karakalpak jewellery making in the 19th to the beginning of the 20th century. Where possible we show the relationships between the different zergers, their dates, clans, the region in which they were working and the types of artefacts that they made. In some cases we are able to give the museum inventory number for those items. 3 Allambergen zerger Taxta Ko'pir region Ha'ykel, tu'yme, ju'zik etc. 4 Amanbek zerger. Senior brother of Kamal (32) Died between 1927-1929 Beksıyıq clan, Zerger tiıre Kegeyli region, Xalqabad sovxoz Sa'wkele, to'belik, 12 qaslı ha'ykel. O'n'irmonshaq KP1912. 5 A'met zerger Nasırov. Son of Nasır (39). Great grandson of Tu'kibay (71) Baqanlı Taxta Ko'pir, sovxoz "Soviet Uzbekistan" See image of him with o'n'irmonshaq above. His tools were preserved. 8* Arzımbet zerger. Son of Aleke (2). Father of Seymurat (64) 1856-1936 Mu'yten Samat Terbenbes, Qazaqdarya Sa'wkele, to'belik, shartu'yme, bilezik, ju'zik, jalpaq tu'yme, jumalaq tu'yme - 12 - KP1992-1997, 1609-1614, sırg'a KP1928, 1984-85, 1991, o'n'irmonshaq - 2 - KP1989-199, 192, ha'ykel KP1988, qız ha'ykel KP1983. 34 Kemal zerger Qazaq nationality Kegeyli Ju'zik KP1537, bilezik KP1547, atanaq sırg'a No. 1549, giltshalg'ısh No. 1535, ha'ykel No. 1543, sırg'a Nos. 2142-2143. 35 Ko'beysin zerger Qarao'zek, Ko'ko'zek A'rebek, sırg'a, ju'zik etc. 43 Nurımbet zerger. Son of Aytımbet Born 1905 Aralbay Xojeli region, Engels kolxoz Sırg'a, bilezik. Materials used were silver and carnelian. Techniques were filigree and granulation. * It is possible that Arzımbet zerger (8) and Orazımbet zerger (46) are the same person. Despite the fact that they are shown as belonging to different clans the territory in which they each worked is the same as is the name of their son. Unfortunately the craft of jewellery making has now largely died out. The only jeweller we have so found in No'kis actually comes from Armenia! Staff from the Savitsky Museum have been trying for several years to find a traditional jeweller who is able to explain the craft, but to date have been unable to do so. Gold or altın was used very sparingly by Karakalpak zergers. The only decoration made of pure gold was the nose-ring � a'rebek. All other adornments were either of silver or an alloy of gold mixed with silver. This is in spite of the fact that there has always been a modest supply of gold within the Khorezm region although the discovery of major deposits in the Qızıl Qum desert at Muruntau, to the east of the Karakalpakstan border in the neighbouring Navoi viloyati, did not occur until 1958. Its limited use may be influenced by two factors; the first being the cost and the second the beliefs linking silver with the moon and fertility making it preferable to gold for use in women's jewellery. 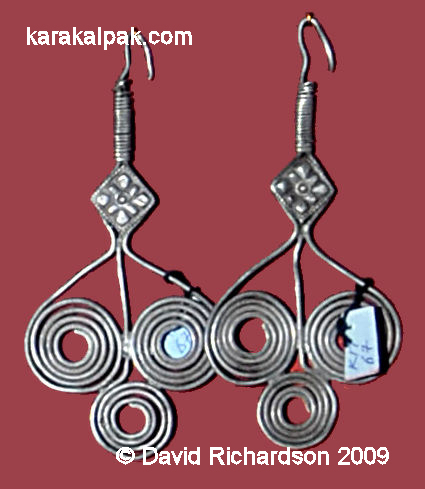 The vast majority of Karakalpak jewellery was made of silver (gu'mis), though it was often of poor quality. In the 1850s silver bars started to be imported from Russia. Some items were made of Russian and Khivan coins, provided to the zerger by their customers. 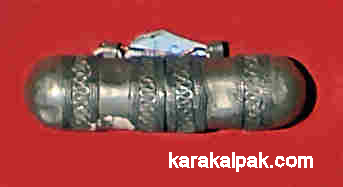 Known as qola in Karakalpak this is an alloy usually of copper and tin. It was used for making some examples of giltshalg'ısh, qola bilezik and for the jewellers' moulds � qa'lip. 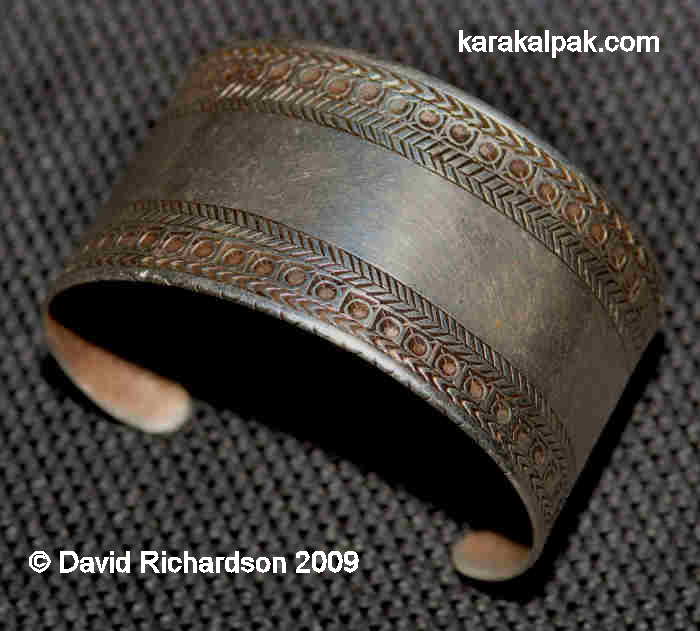 Copper is known as mıs in Karakalpak and is sometimes used for the cast bracelets � quyma bilezik. It was mainly used for the production of ewers and jugs. This is an alloy of copper and zinc and is known as jez in Karakalpak. The only items made from brass were the special ritual bracelets known as jez bilezik. This was an admixture of gold and silver, melted to form a very malleable metal which was pale yellow in colour. The alloy usually consisted of 1 mısqal of gold to 1-3 mısqal of silver. Mısqal is the Karakalpak term for the Russian zolotnik or weight equal to 4.26 grammes. A variety of adornments were made from this metal such as rings, earrings and bracelets. These were normally named after the item and the metal used - for example tilla' ju'zik . The Karakalpak term is piruza and it is also a commonly used girl's name. It was used in a variety of adornments including a'rebek, bilezik, o'n'irmonshaq, and shartu'yme. Local turquoise deposits occur in the Sultan Uvays Dag range of southern Karakalpakia, in the Nurata Mountains and in rock outcrops in the Qızıl Qum, especially around Muruntau. However some of the highest quality turquoise was imported into Central Asia from mines located around Nishapur in the Persian province of Khurasan. Khurasan was noted for its turquoise in the Hudûd al-Âlam and Clavijo reported that it was also found in the bed of the river close to Nishapur. Marco Polo also referred to turquoise from the mountains of Kerman. Babur had heard that turquoise mines were located in the mountains close to Khodjent, while Shuyler noted that inferior turquoise was found in the mountains close to nearby Kokand. There is no special Karakalpak word for this stone. 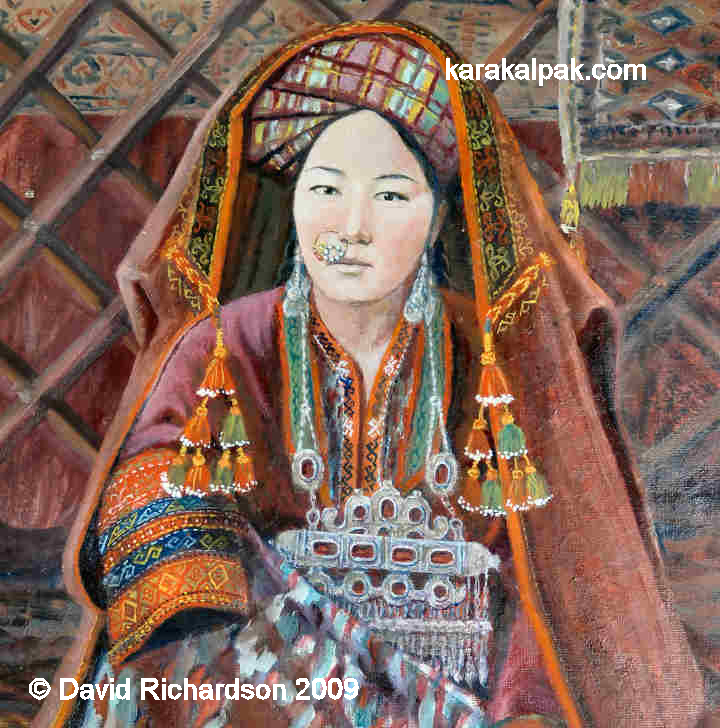 The Karakalpaks tend to use the expression hasıl tas which simply means precious stone. Carnelian is used in many Karakalpak jewellery items but most notably in the ha'ykel and qaslı bilezik. Qaslı ju'zik set with carnelian are greatly valued as it is believed that the Prophet Muhammed himself wore a carnelian set in a silver ring on the little finger of his right hand. Carnelian is a form of cryptocrystalline quartz. It is not found in Karakalpakia but is mined in neighbouring Uzbekistan and northern Afghanistan. There are also smaller local deposits in the Bushehr peninsula of Persia and in the Helmand province of Afghanistan. It is important to note that only the wealthy could afford these stones and that imitations of red glass or even clear glass with coloured paper underneath were often used instead. The Karakalpak term for coral is marjan and its main use was in the sa'wkele. It was also used to a lesser degree in necklaces, the fringes of ha'ykel, sırg'a, o'n'irmonshaq, and a'rebek. Coral was, and still is, regarded as a talisman in many cultures with the power to ward off evil spirits and the malignant effects of the evil eye. It is associated with the planet Mars. Coral is foreign to Central Asia and must have been imported from the Mediterranean, India, or China - Mediterranean coral being the most sought after. In the Mediterranean coral is found along the coasts of Algeria and Tunisia, in Spain, France, Corsica, Sardinia, and Sicily, and in Turkey and the Red Sea. The Persian Hudûd al-Â:lam, written in 982, recorded that there was no place like Tabarqa in the Maghreb for coral, with its offshore coastal coral banks, although it was also imported from Hindustan. In 1222 the Chinese delegation accompanying the Taoist monk K'iu Ch'ang Ch'un purchased fifty coral branches from Mongol soldiers who were returning from "the Muslim territories" to Mongolia. The Chinese were travelling back to Samarkand from a meeting with Chinggis Khan in the foothills of the Hindu Kush. Marco Polo found that coral was especially highly valued in land-locked Kashmir. Coral also occurs in the coastal waters of India and Sri Lanka, China and Malaysia. When Ole Oulfsen was in Bukhara in the late 19th century he found that coral or mardyan was greatly valued for female adornment. It was brought overland from China and "magnificent specimens both in white and in red" could be found on all the bazaars. As with all of the other jewellers of Central Asia Karakalpak zergers used a variety of techniques. These included forging (taplaw), casting (quyıdan), engraving (nag'ıs oyıw), granulation, stamping (shtampovkalaw), gilding (altın jalatıw), and silver plating (gu'mis jalatıw). Gilding was very common. Obviously only the rich could afford items of gold and silver alloys � the poor had jewellery made from baser metals such as tin and copper which were then overlaid with a thin layer of gilding. The method of gilding used by Karakalpak zergers was called altın puwın jalatıw. To gild silver articles one mısqal of gold was mixed with eight mısqal of mercury (sınap). This liquid solution was kept in special dishes. They then shook it up with a tool known as a soyqal and covered the item with a thin layer. Engraving of the pattern on jewellery was done using very simple tools. First they drew the outline of the pattern and then engraved it using metal rods of different thickness with sharpened ends. 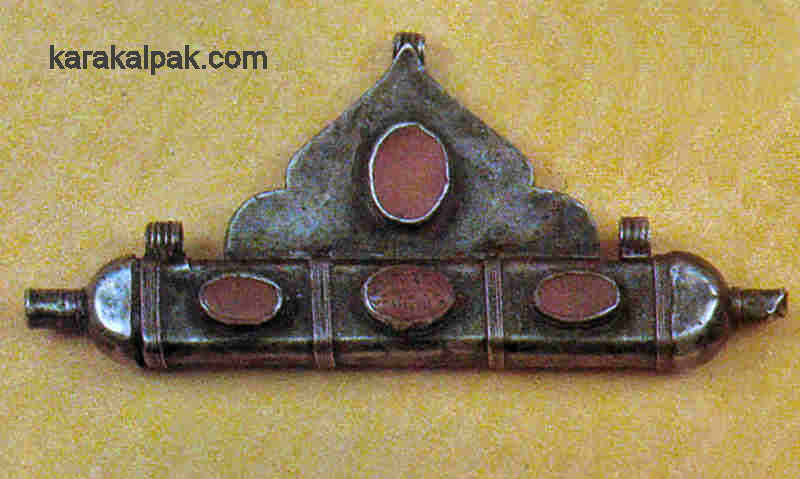 All jewellers had a collection of bronze moulds (qa'lip) with various patterns on them. A thin sheet of silver was placed on the mould and covered with a piece of lead. This was then hit with a hammer forcing the soft lead and silver into the depressions and creating a relief ornament. This technique was mainly used for the pendants of the ha'ykel, o'n'irmonshaq, and some sırg'a. 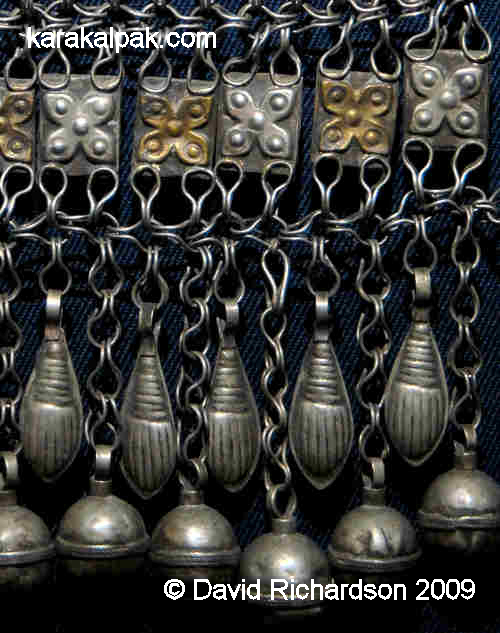 Rows of decorated platelets or shıtaq suspended from the chains of a ha'ykel. We can see that a mould similar to the one in the top right corner of the following illustration was used to make some of the pendants on this ha'ykel. A set of shıtaq moulds once used by the master-jeweller Qoraz Tilewbayev from Shomanay region. Sketch of an unfinished cast bracelet made by Qoraz Tilewbayev, 1848-1919. Pair of quyma bilezik from the Savitsky Museum, No'kis. O'temisov was able to compile a complete list of the equipment used by a zerger from information given by Nurımbet Arzımbetov from Xojeli and from the examination of a workshop used by Xudaybergen (which contained the tools of his grandfather Tilewbay shown above), which was still preserved in the Shomanay region. Most of the zergers tools were made by blacksmiths although they did make some themselves. These tools were usually passed on from one generation to the next. The most comprehensive display of v jewellery is found in the Karakalpak State Museum of Art named after Igor Savitsky in No'kis. For detailed information on visiting this museum see our Sightseeing page. A smaller range of items was on public display at the former Karakalpak Regional Studies Museum which unfortunately closed in 2010. A new building housing this museum may open in the city centre in 2012. 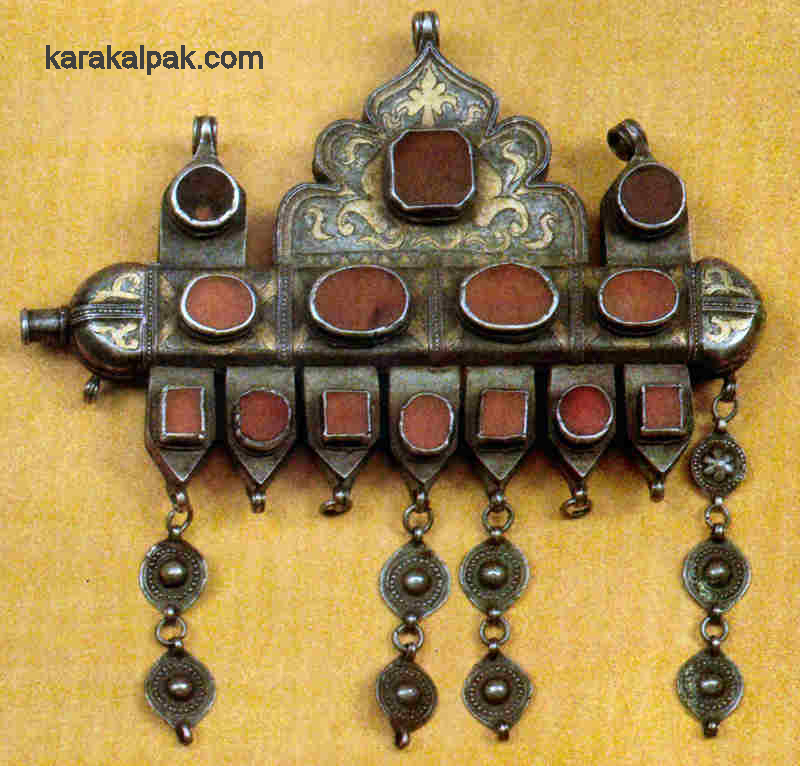 In Tashkent the Decorative Arts Museum has a small display of Karakalpak items in the jewellery section. According to Beresneva there are 60 Karakalpak jewellery items in the State Museum of Oriental Arts, Moscow, originally received as a gift from Savitsky. However these are mainly held in the reserve fund and are not on public display. Alieva, Z., Fakhretdinova, D. A., The Jeweller's Art, Atlas of Central Asian Artistic Crafts and Trades, Uzbekistan, Volume 1, pages 28-32 and 116-122, Sharq Publishing, Tashkent 1999. Allamuratov, A., The Karakalpak Breast Adornment Haykel [in Russian], Ethnic history and Traditional Culture of the People�s of Central Asia and Kazakhstan, pages 77 to 87, Karakalpakstan Publishing, No�kis, 1989. Allamuratov, A. Everlasting Heritage [in Karakalpak], Bilim, No'kis, 1993. Anon, Atlas of Asiatic Russia, Petrograd, 1914. Beresneva, L. G., Kazakh, Kirgiz and Karakalpak Jewellery, Arts & The Islamic World, Number 33, pages 85-88, Islamic Arts Foundation, London, 1998. Dospanov, O., Allamuratov, A. and Tilewmuratov, G., Karakalpak Glossary of Artistic Crafts [in Karakalpak], Bilim, No'kis, 1991. Esbergenov, X., Xoshniyazov, J., Ethnographic Motifs in Karakalpak Folklore [in Russian], Fan, Tashkent, 1988. Esbergenov, X. Questions of the ethnic history and traditional culture of the Karakalpaks [in Russian], Ethnic history and Traditional Culture of the People�s of Central Asia and Kazakhstan, pages 53 to 77, Karakalpakstan Publishing, No�kis, 1989. Esbergenov, X., Shartu'yme in the Traditional Culture of the Karakalpaks (Parts 1 & 2) [in Russian], Bulletin of the Karakalpak Division of the Academy of Science of the Republic of Uzbekistan, Number 5, pages 81 to 84, 2005 and Number 1, pages 64 to 67, 2006. Esbergenov, X., Ethnography of the Karakalpaks [in Russian], Chapter 2, Fan, Tashkent, 1980 Fakhretdinova, D. A., Jewellery Art of Uzbekistan [in Russian], Gafura Gulyama Publishing, Tashkent, 1988. Galkin, M. N., Excerpts from the diary of movement in 1858; from Orenburg to Khiva by the Kirgis Steppe and the Amu Darya, Ya. A. Isakova, St. Petersburg, 1868. Gladyshev, D. V., Muravin, I., Journey from Orsk to Khiva and back, completed in 1740-1741 by Lieutenant Gladyshev and Geodesist Muravin [in Russian], Published by Khanykov, Saint Petersburg, 1851. Kalter, J., Pavaloi, M., Uzbekistan: Heirs to the Silk Road, Thames and Hudson, 1997. Kurbanova, Zemfira, Academic Secretary, Karakalpak State Museum of Art named after Igor Savitsky, No'kis, Private Correspondence, 2008 and 2009. Medzhitova, E., Dzhumaniyazova, M, Grishin, Ye., Turkmen Folk Art [in Russian], Turkmenistan Publishing, Ashgabat, 1990. O'temisov, A., Karakalpak Handicraft-Trades [in Karakalpak], Karakalpakstan Publishing House, No'kis, 1991. Pirnazarova, A., Curator of Costume and Jewellery, Karakalpak State Museum of Art named after Igor Savitsky, No'kis, Private Discussions, 2001, 2002, 2003, 2004, 2005, and 2007. Riza Quli Mirza, Brief Description of the Amu Darya Region, Saint Petersburg, 1875. Savitsky, I. V., People's Applied Arts of the Karakalpaks, [in Russian], Science, Moscow, 1964. Savitsky, I. V., Panzhinskaya, V. A., Album of the State Museum of Art of the Karakalpak ASSR [in Russian], Published by "Soviet Artists", Moscow, 1976. Schletzer, D., R., Alter Silberschmuck der Turkmenen [in German], Dietrich Reimer Verlag, Berlin, 1983. Shalekenov, U., The way of life of the Karakalpak peasants of the Chimbay region in the past and present [in Russian], Material and Research on the Ethnography of the Karakalpak, Published by the Academy of Sciences of the USSR, Moscow, 1958. Sobolyev, L. N., Letters about the Amu Darya Expedition [in Russian], Russian Invalid, Numbers 213 and 216, Saint Petersburg, 1874. Tooke, W., Russia: or a Complete Historical Account of All the Nations which Compose that Empire, Volume 1, J. Nichols, T. Cadell, H. Payne and N. Conant, London, 1780. We would like to acknowledge our gratitude for the help which we have received from our many Karakalpak friends in translating information for this webpage. This page was first published on 6 April 2009. It was last updated on 5 February 2012.